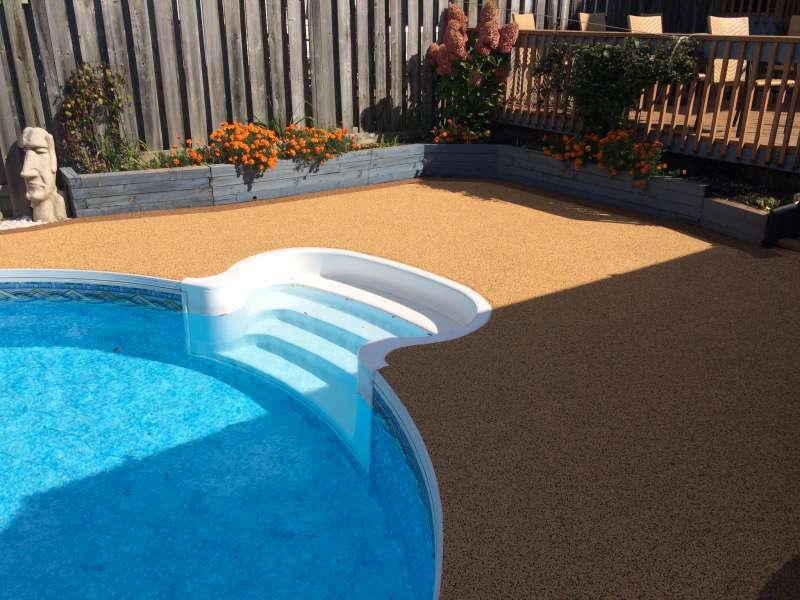 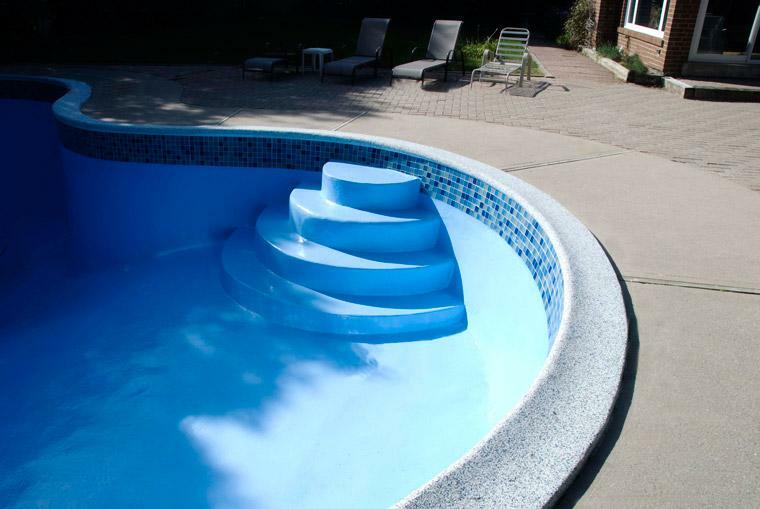 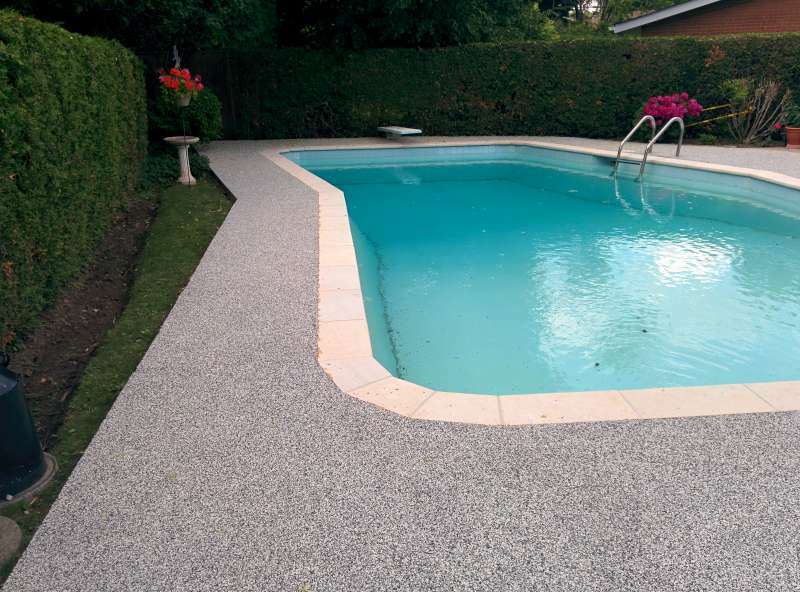 The perfect solution for your cracked or uneven pool deck. 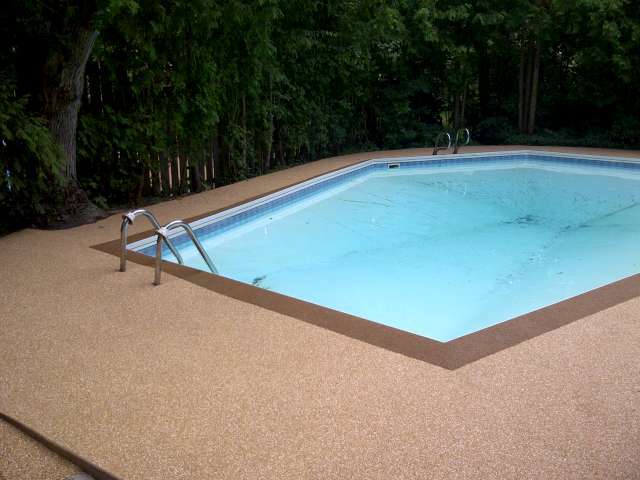 A poured in place surface can be applied on any existing surface to fill in cracks or gaps to create a custom appearance that is seamless, beautiful, and slip-resistant. 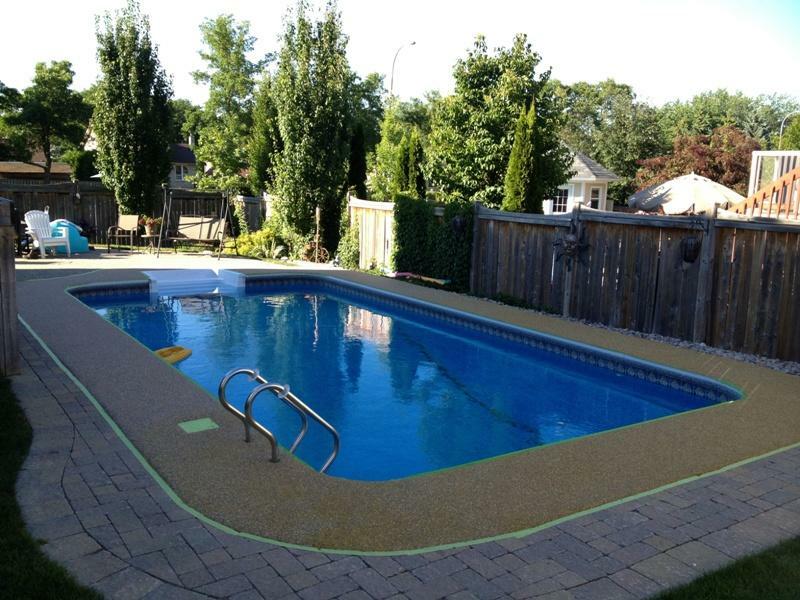 An Ontario certified safety product is the perfect material to protect your family from injury and increase the value of your home. 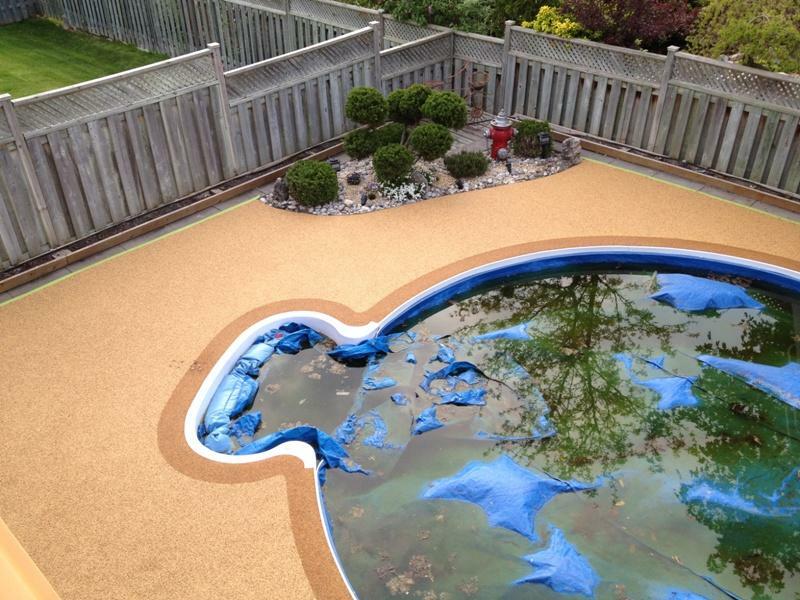 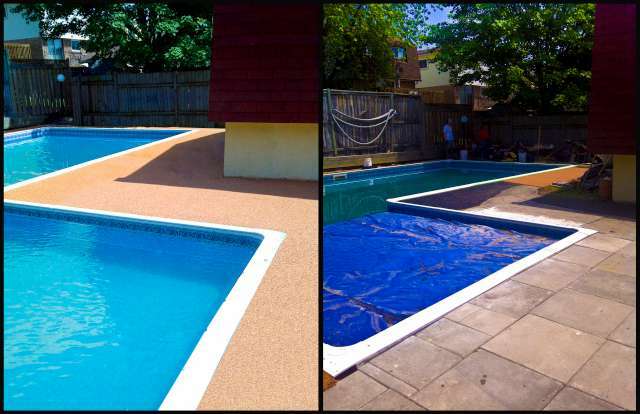 Details: New pool lines were required which left the existing concrete deck with many un-attractive patches. 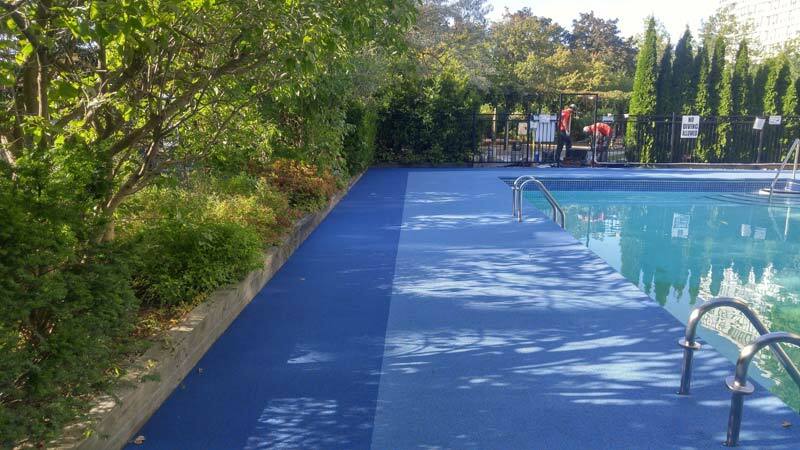 We applied a water cured polyurethane resin to protect the concrete and applied a slip resistant safety surfacing in two different tones of blue. 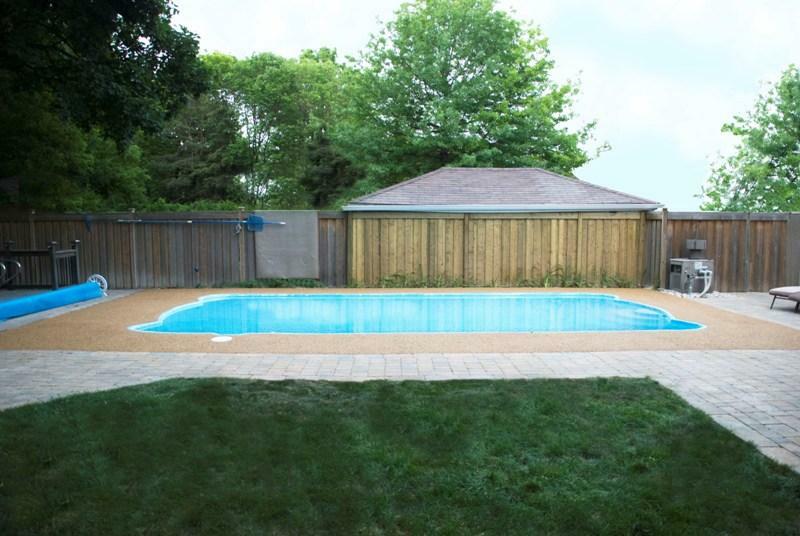 Details: Pool extension created to reach front of shed. 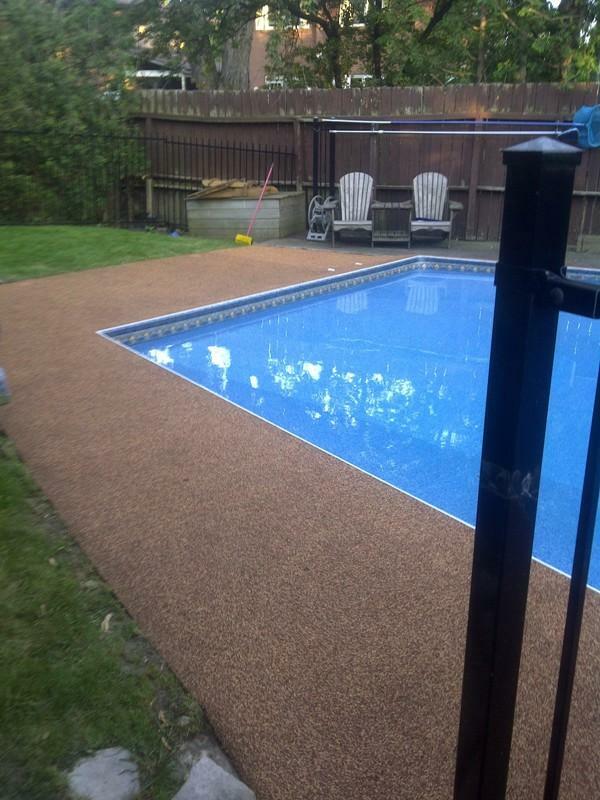 Base extension area prepared with compacted granular aggregate and SBR rubber applied in layers. 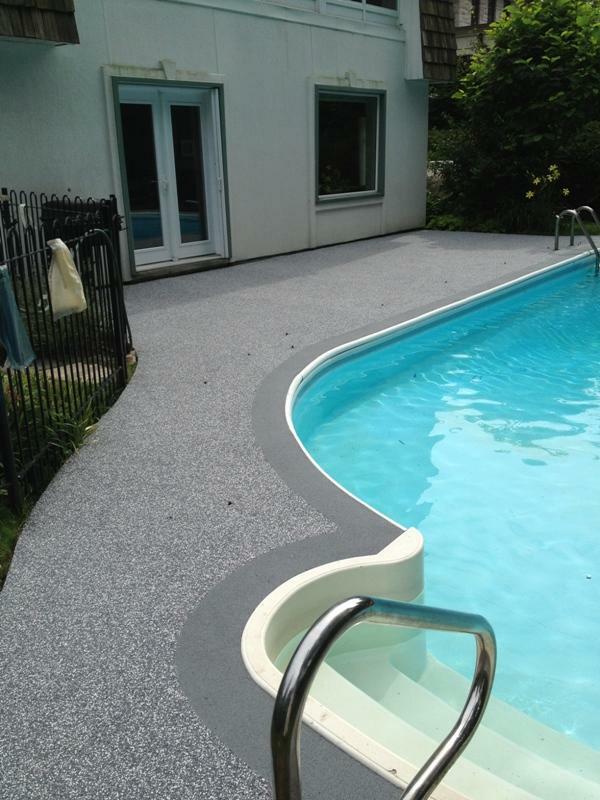 Top coat applied over complete surface using EPDM rubber. 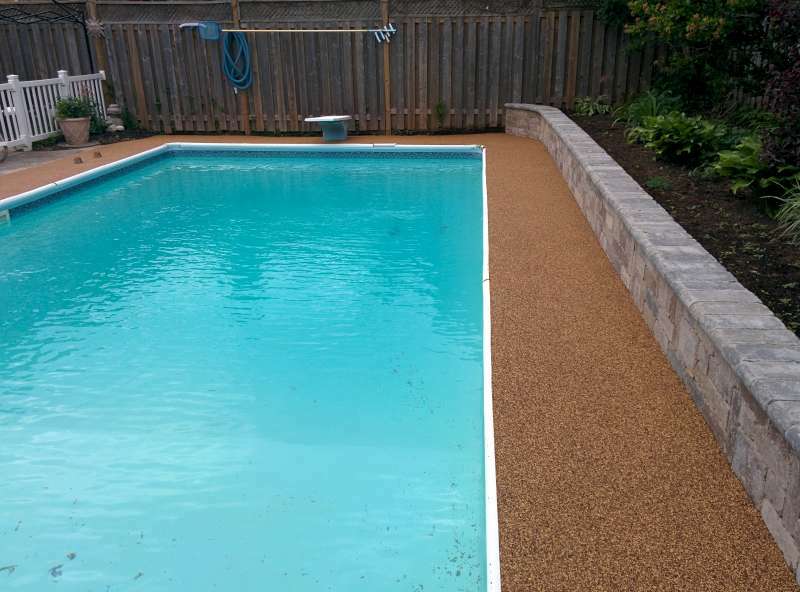 Details: Applied over concrete and interlocking brick base. 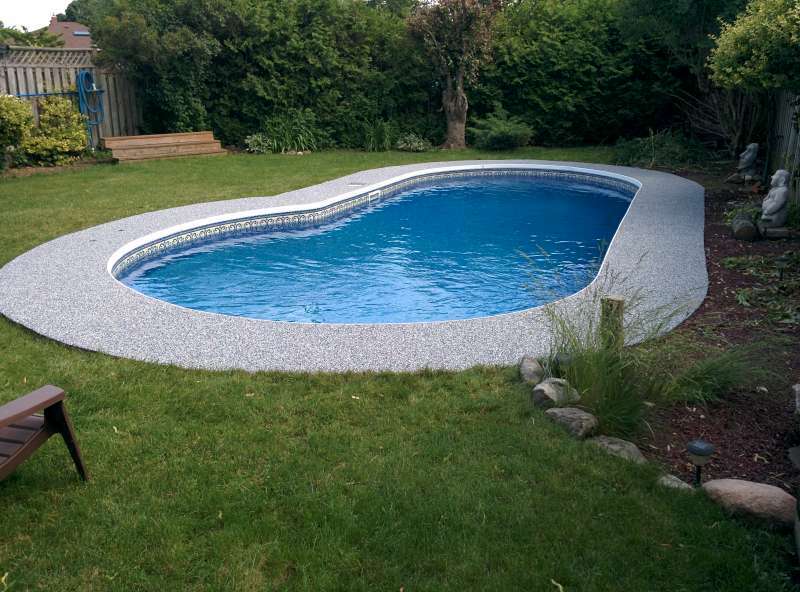 Details: Jewel stone base was chipping and dangerous. 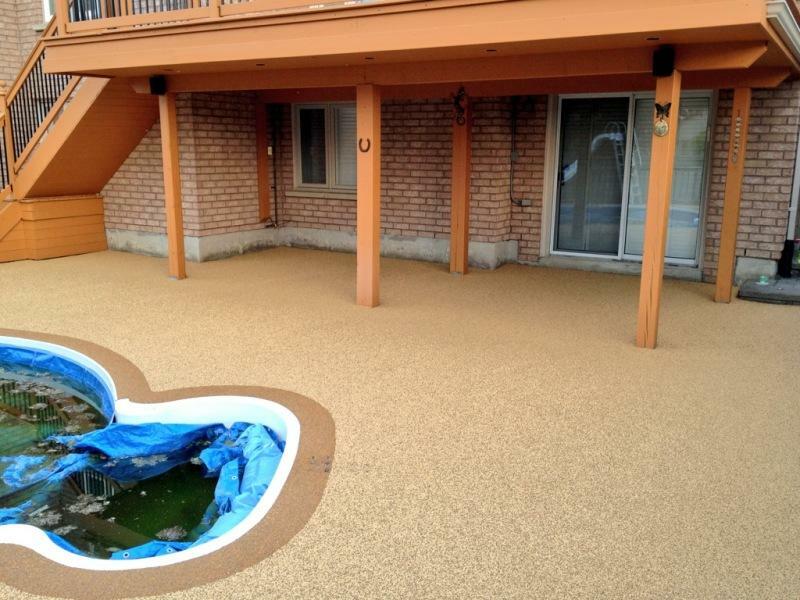 Jewel stone base was removed and EPDM safety surfacing rubber was applied over top of the prepared concrete base. 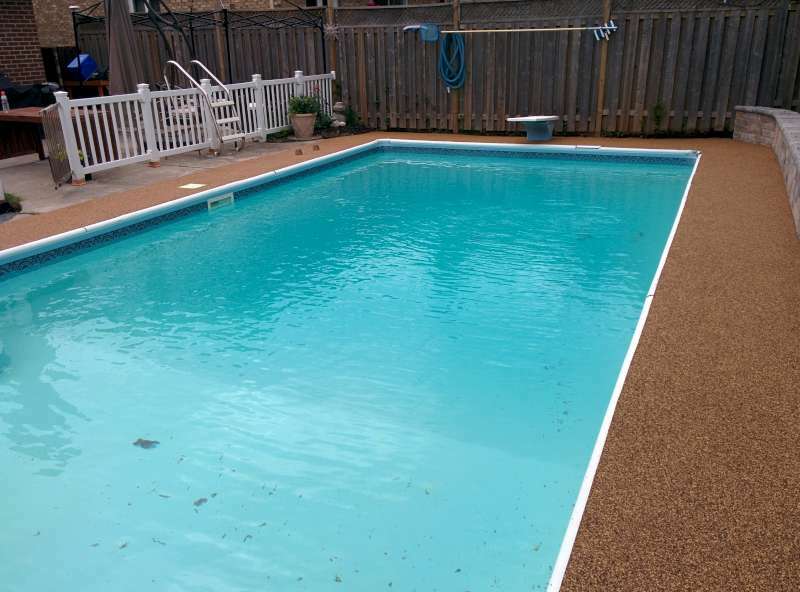 Details: Surface was applied over existing interlocking brick surface. 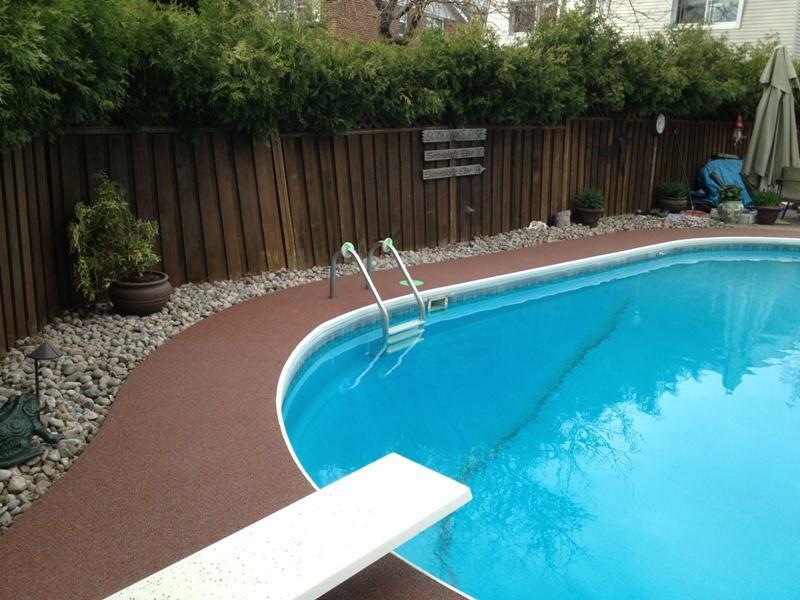 Interlocking brick was leveled using SBR rubber and protected using a polyurethane primer coat prior to rubber installation. 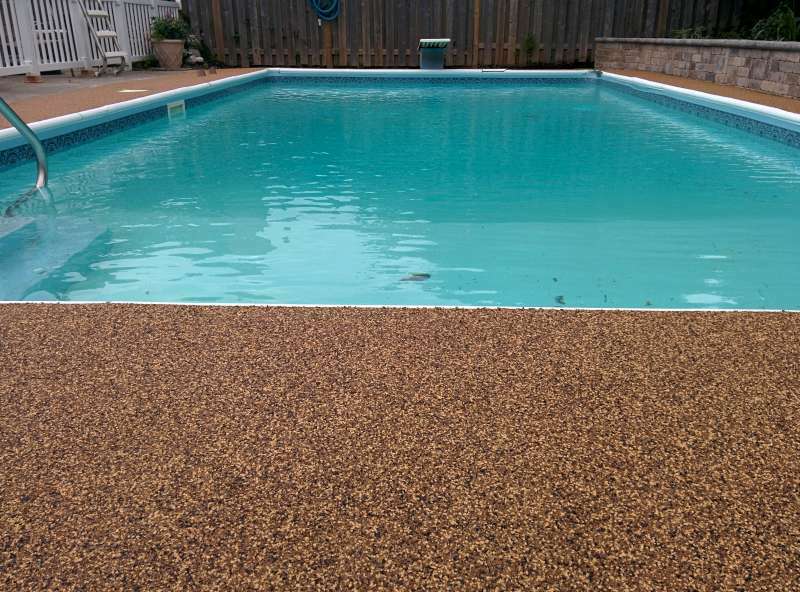 Details: Rubber surface installed over un-level concrete slabs. 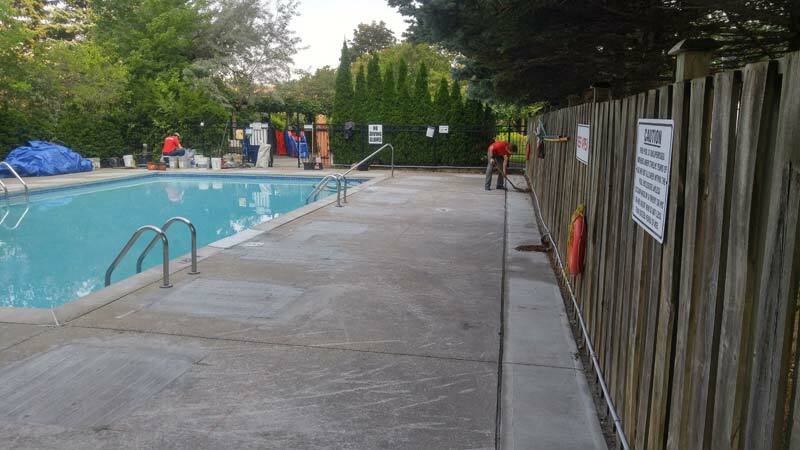 Prior to installation the concrete slabs were leveled using SBR rubber and protected using a polyurethane primer coat. 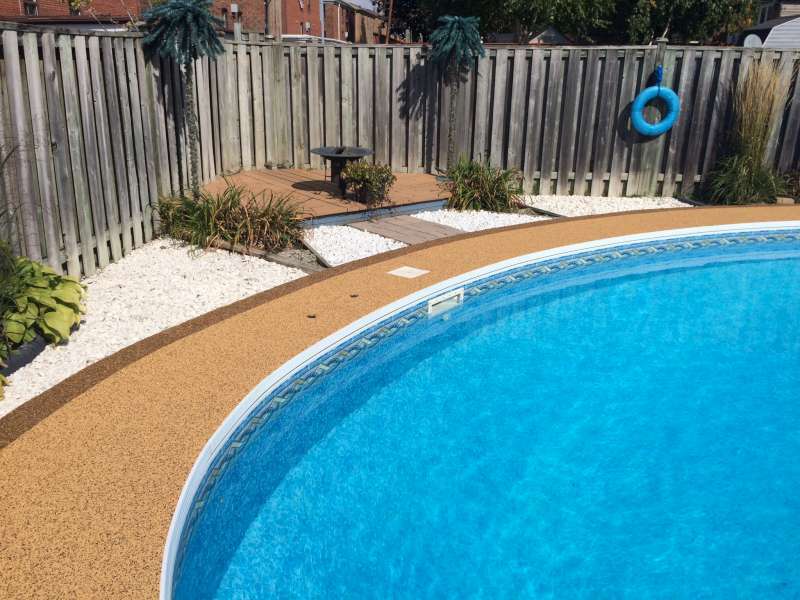 Details: EPDM rubber surface applied over interlocking brick surface. 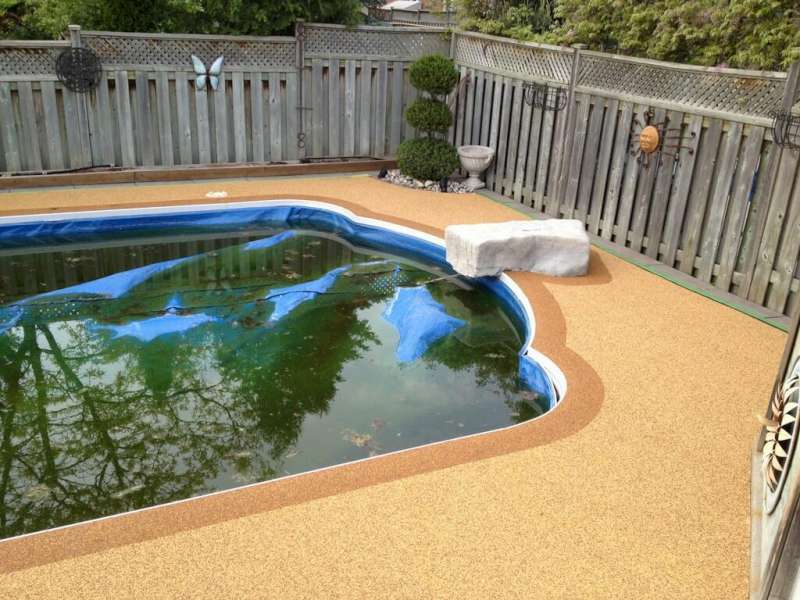 Details: EPDM rubber surface applied over existing concrete surface. 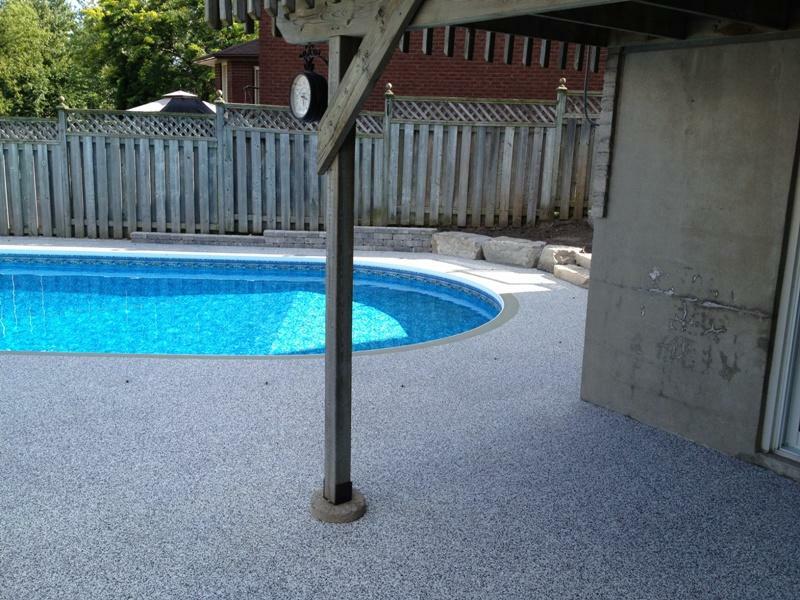 Cracked and un level areas fixed with SBR rubber and a polyurethane sealant. 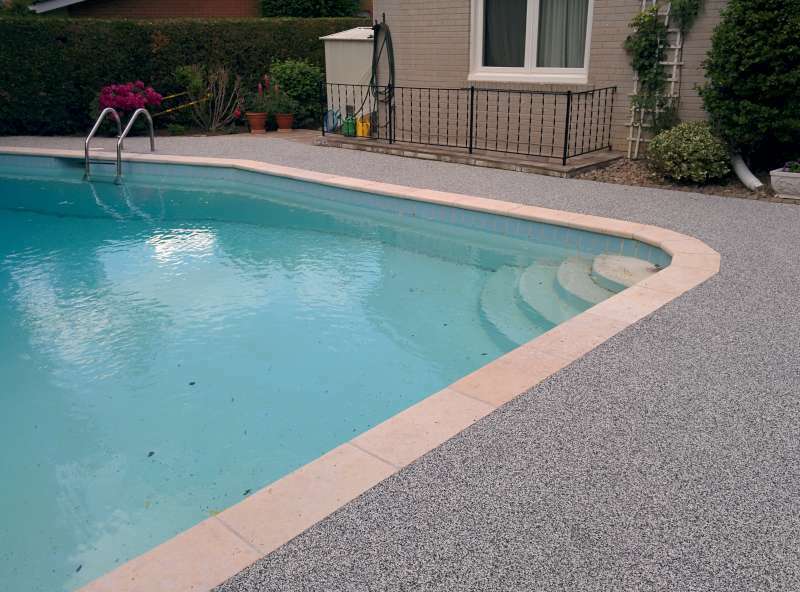 Details: Chipping jewel stone base was removed and concrete repaired using SBR rubber and polyurethane resin. 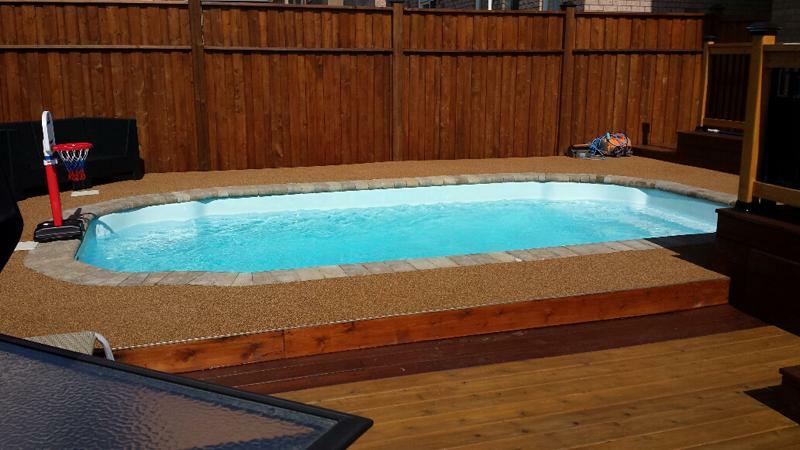 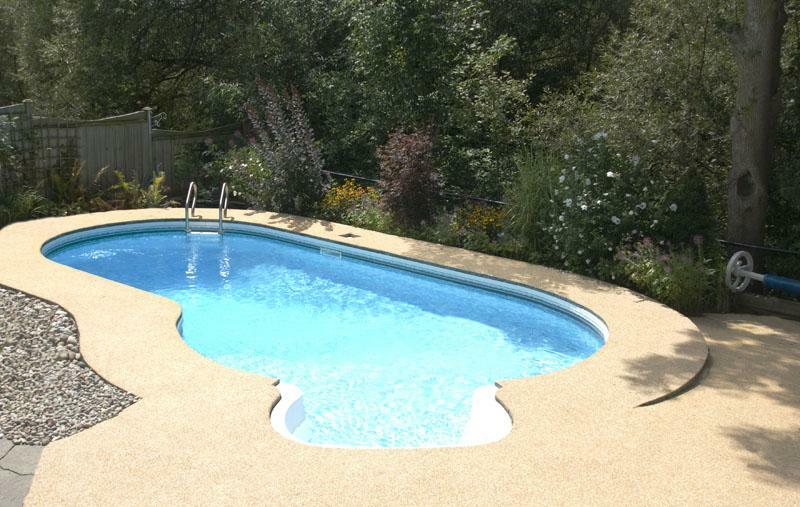 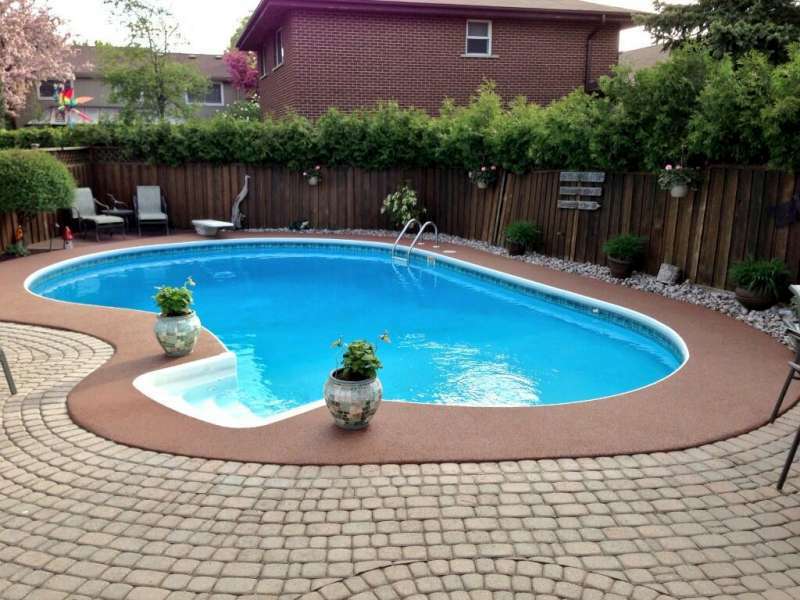 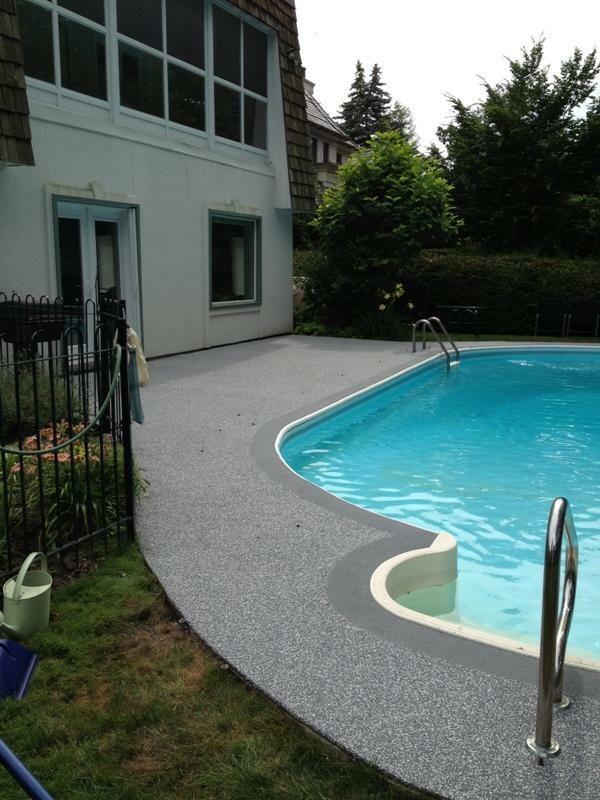 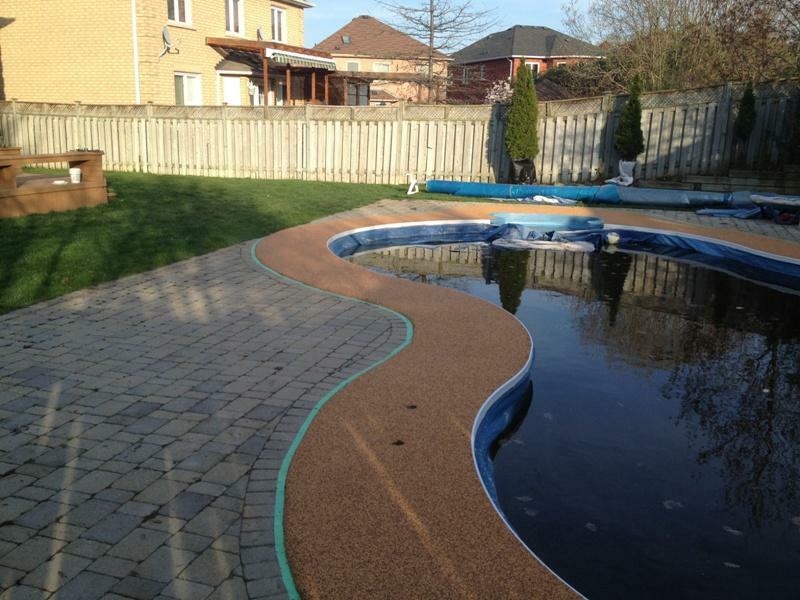 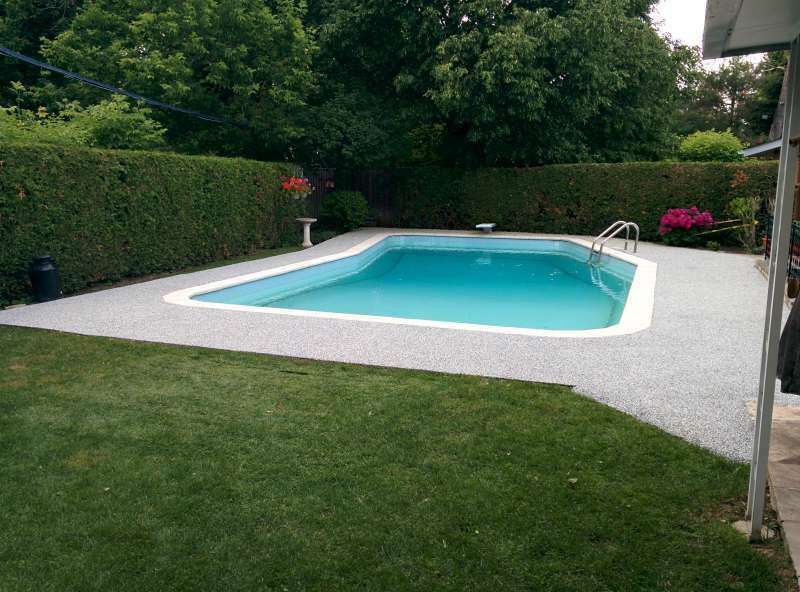 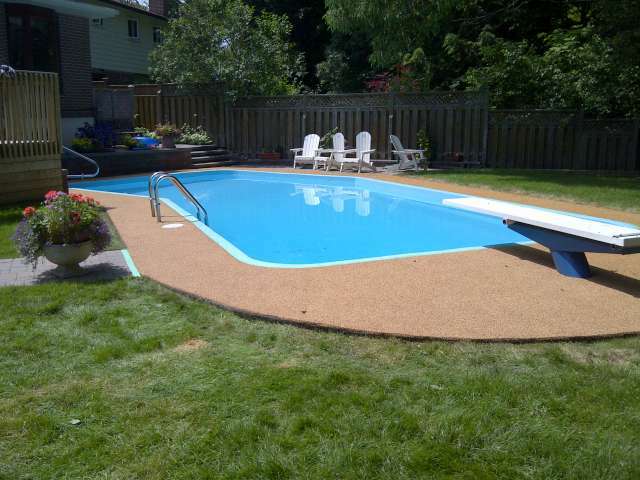 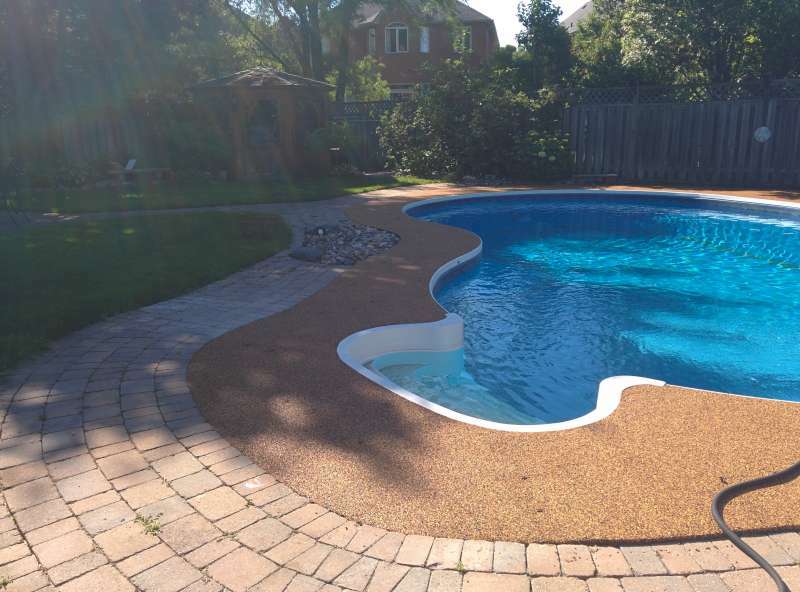 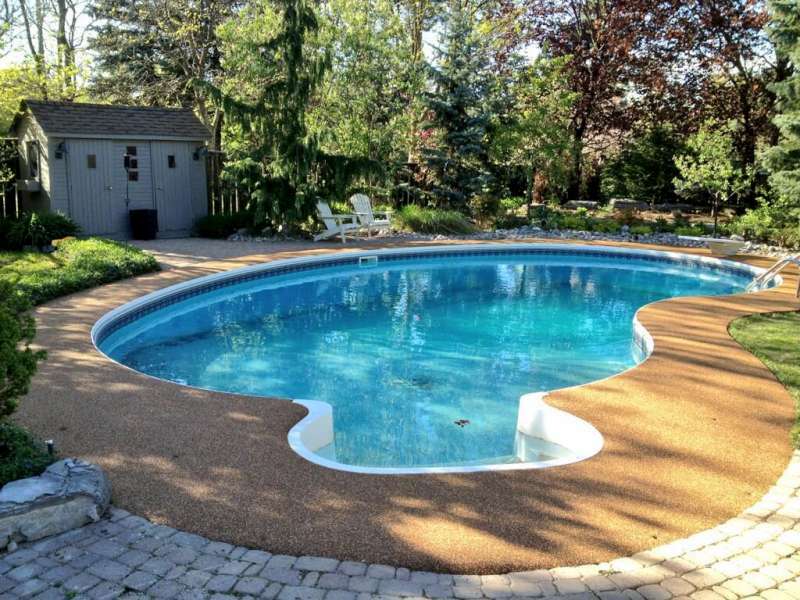 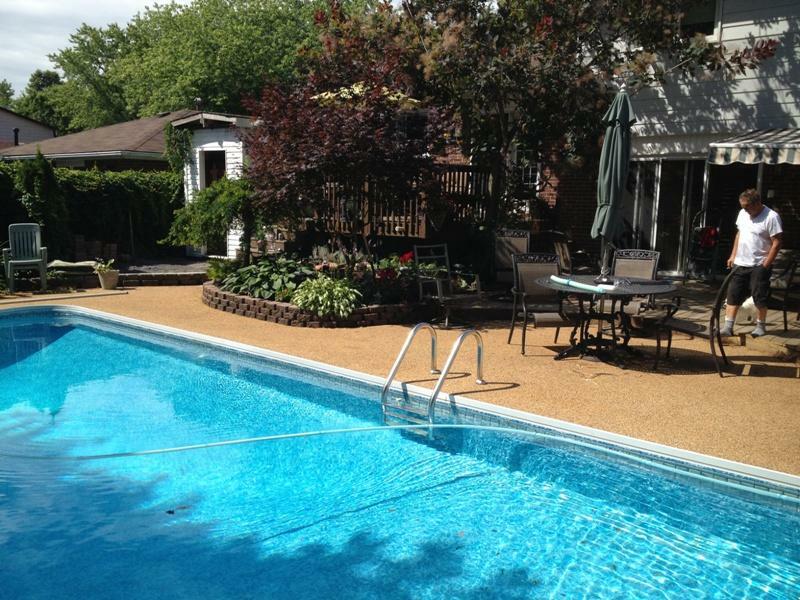 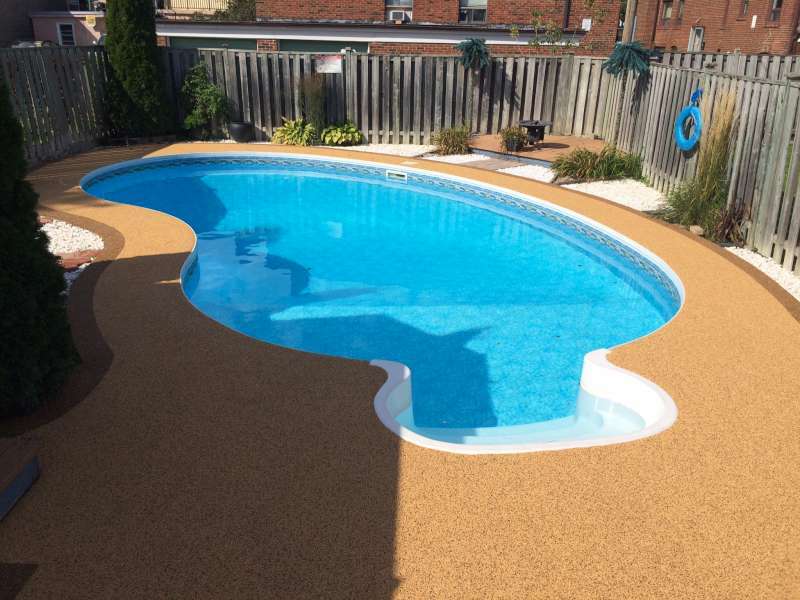 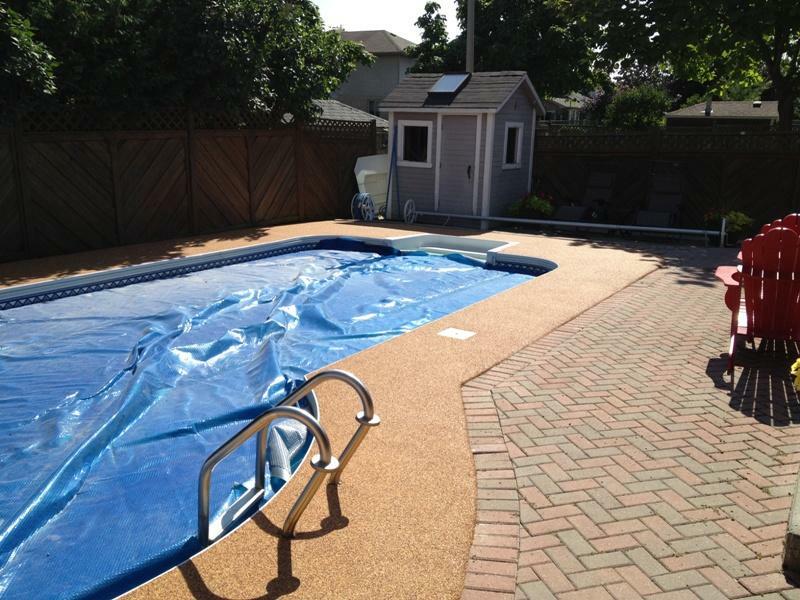 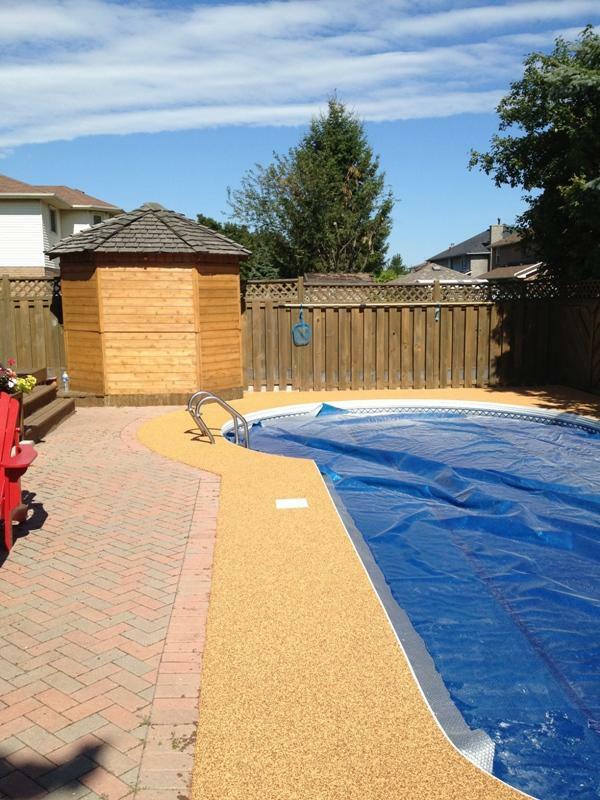 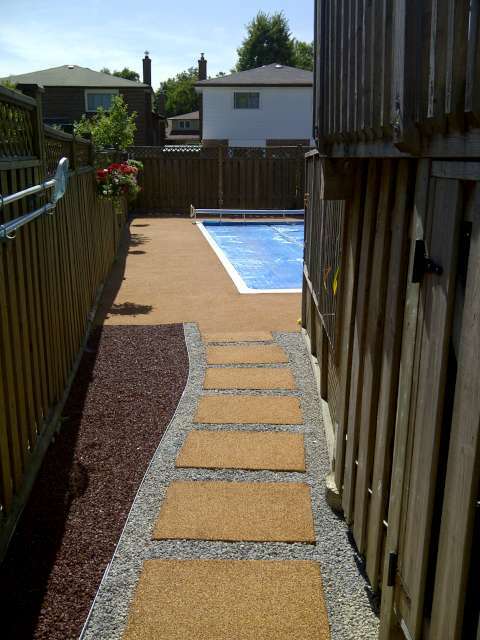 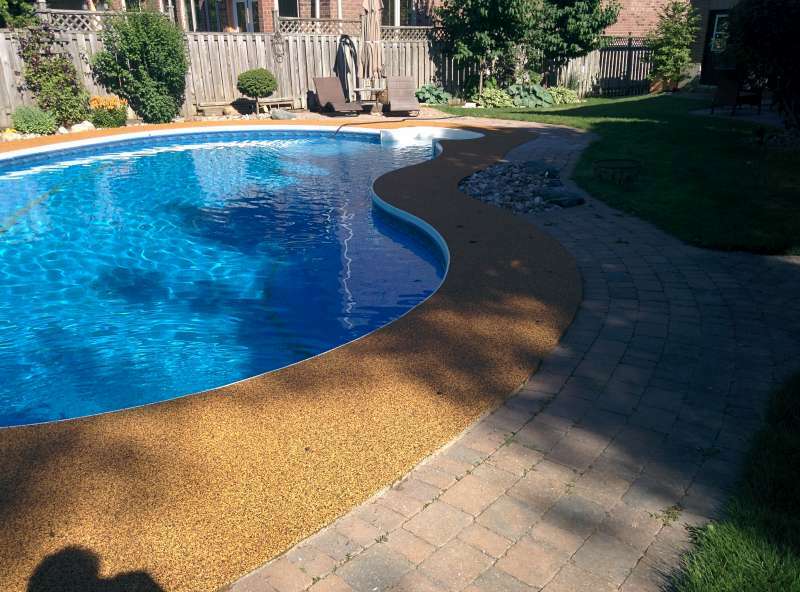 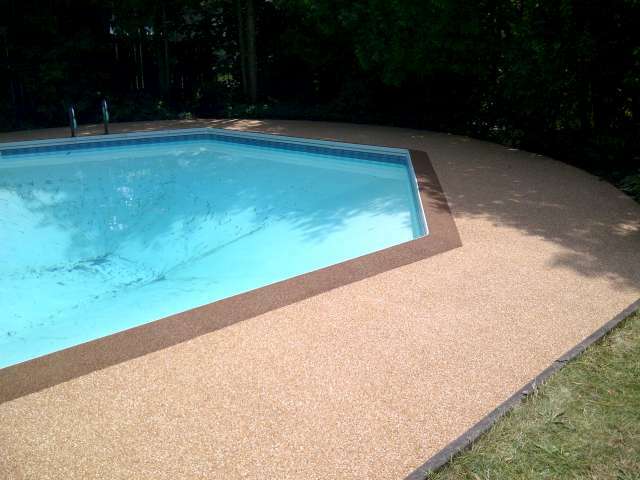 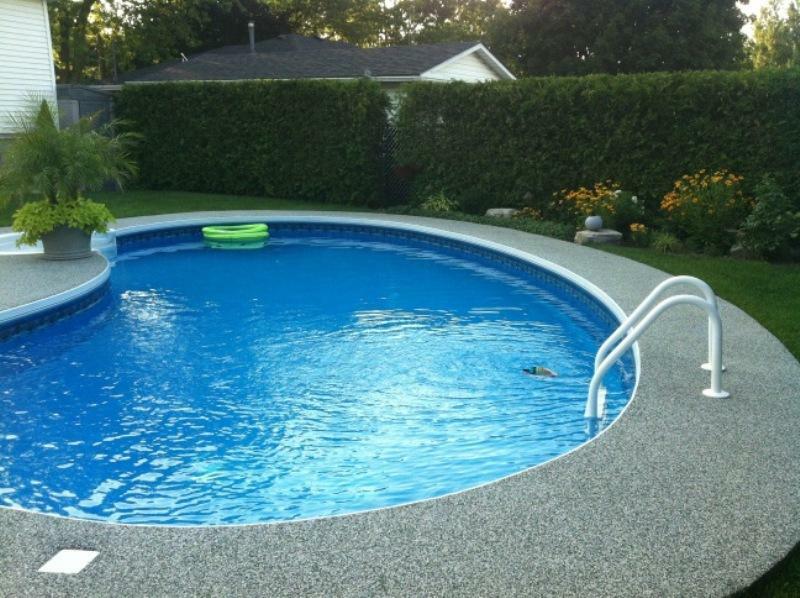 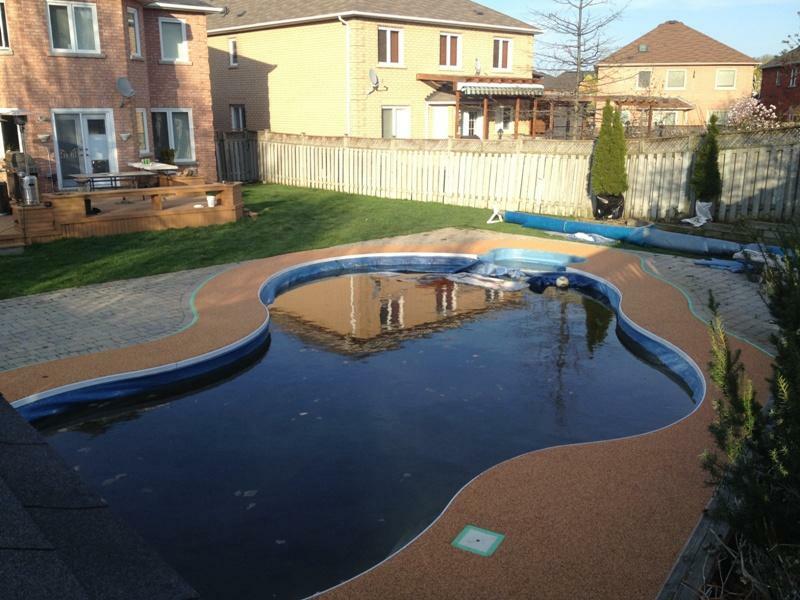 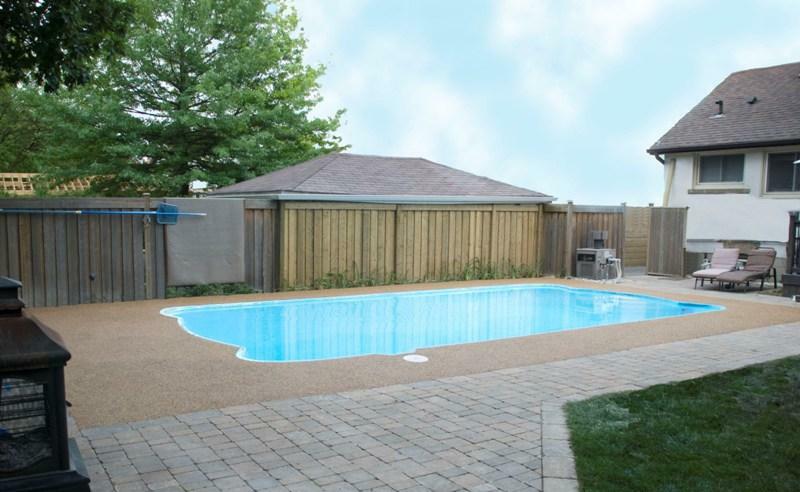 Pool deck was resurfaced using EPDM rubber and inlayed with a double boarder and stone circle design features. 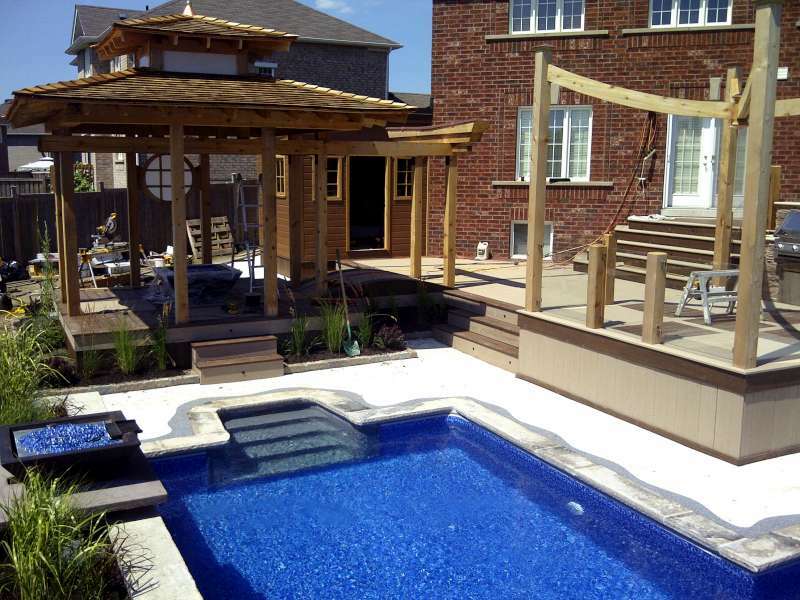 Details: Concrete and wooden pool deck. 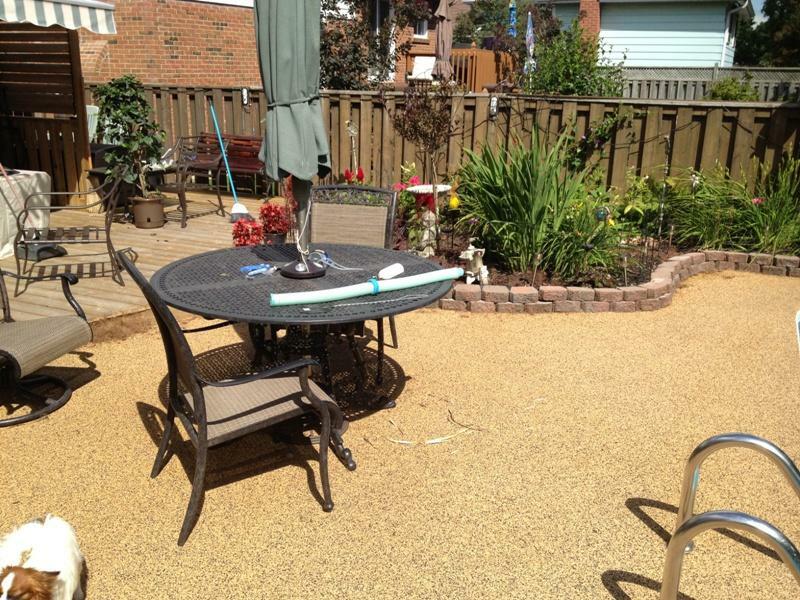 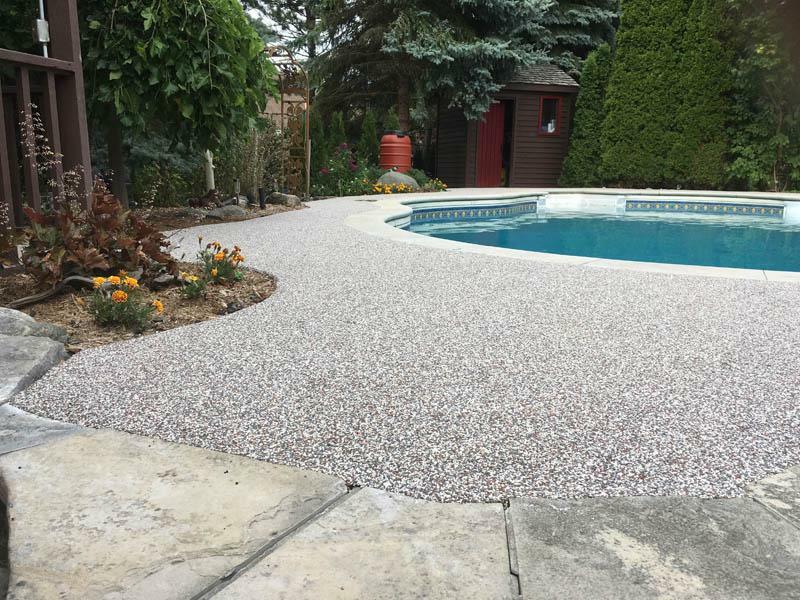 Old wooden deck was removed and filled with granular aggregate and SBR Rubber to bring the area flush with the concrete deck. 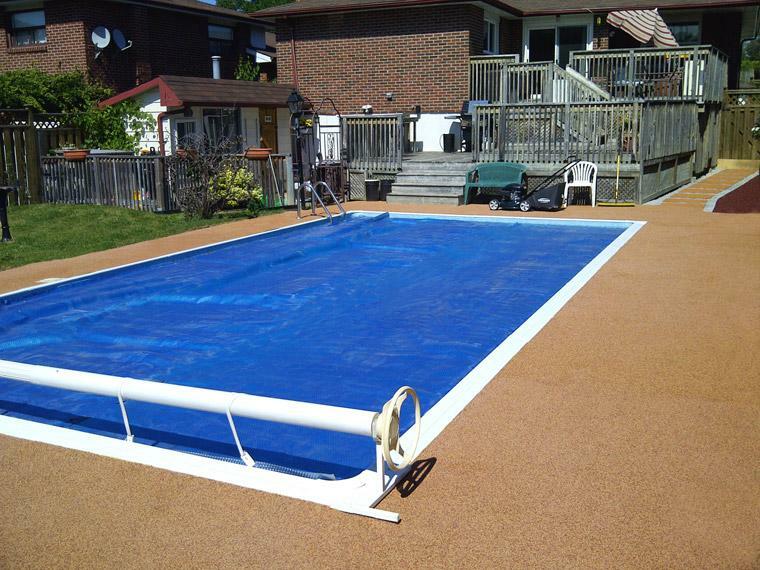 Then the complete surface was covered with EPDM rubber and inlayed with a darker boarder around the perimeter. 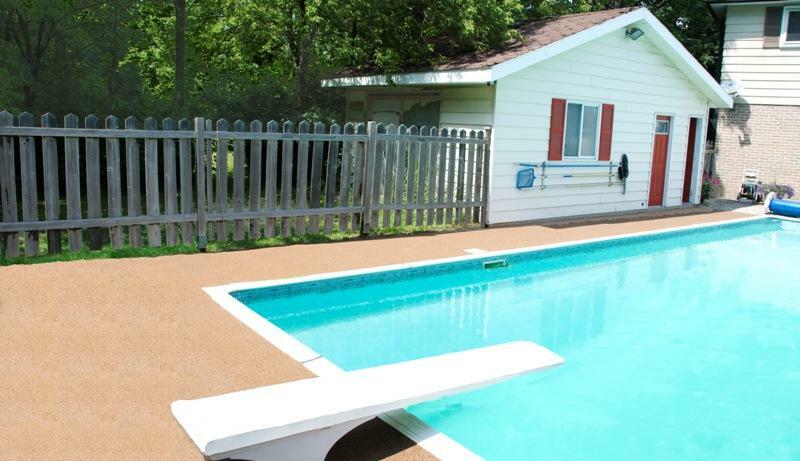 Details: Concrete pool deck was unsafe and too slippery for children to play on. 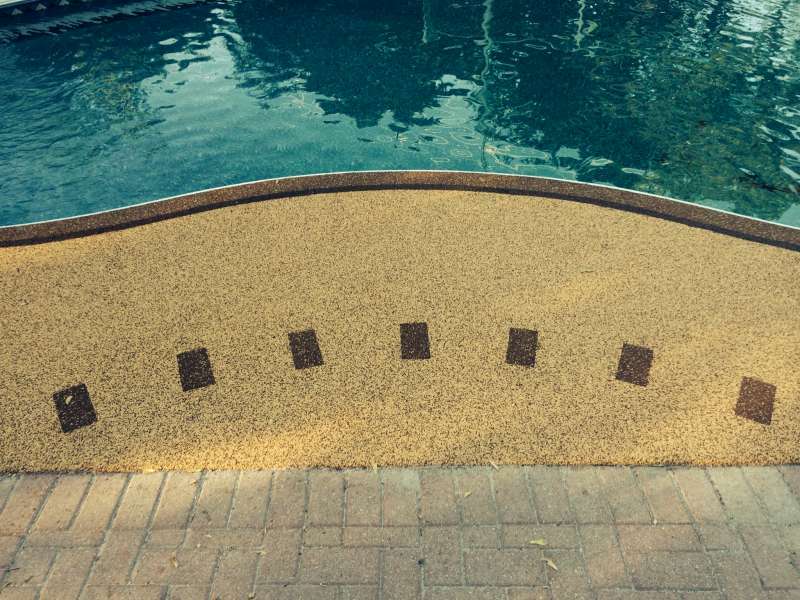 Complete area was resurfaced using EPDM Rubber and polyurethane resin to create a safe and non-slip surface. 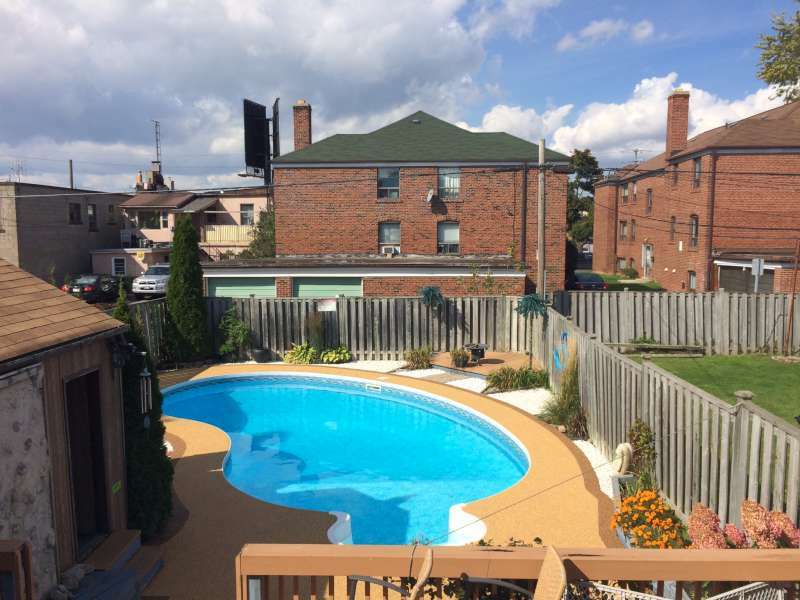 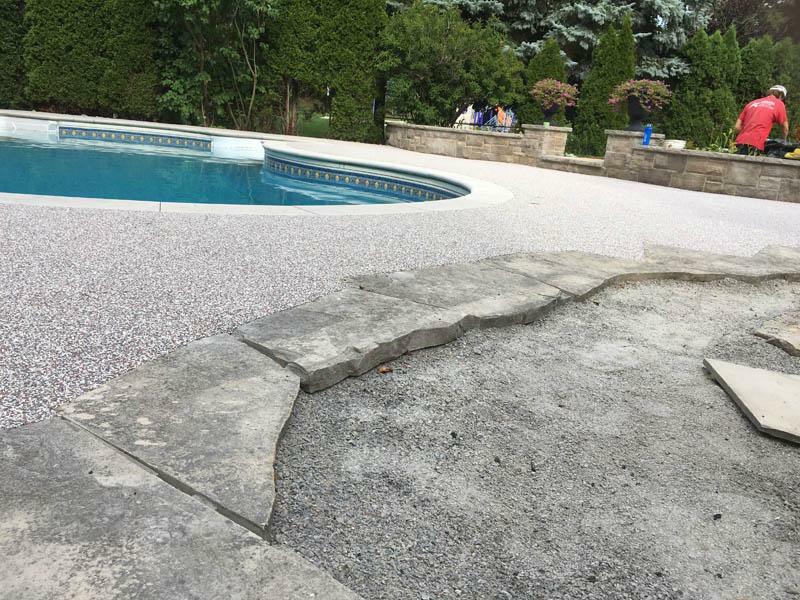 Details: Concrete pool deck with surrounding patio stones had become un-levelled and dangerous. 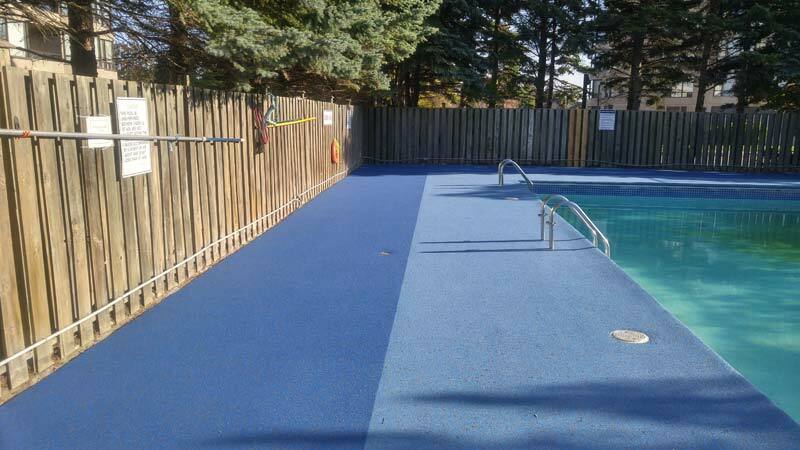 The low points were brought up to level using SBR rubber and then the complete pool deck area was resurfaced with EPDM rubber and resin to create a safe. 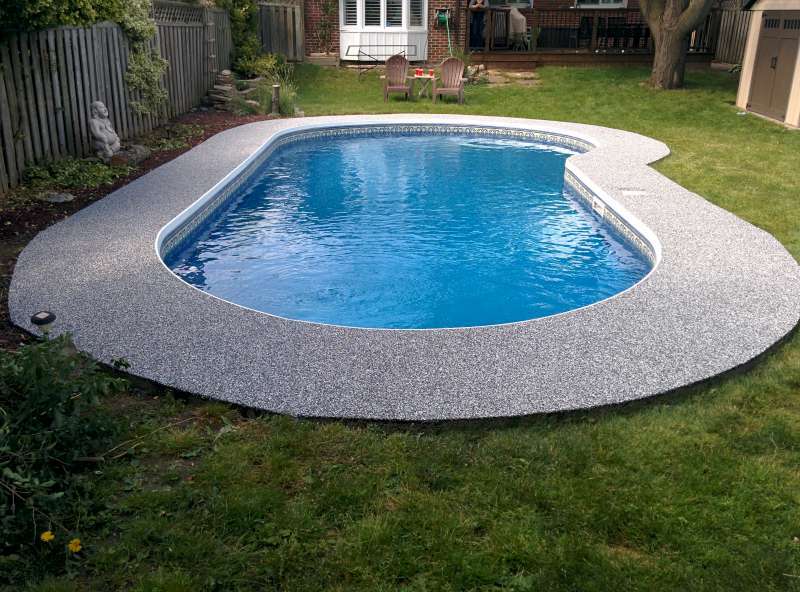 Level, and beautiful pool deck. 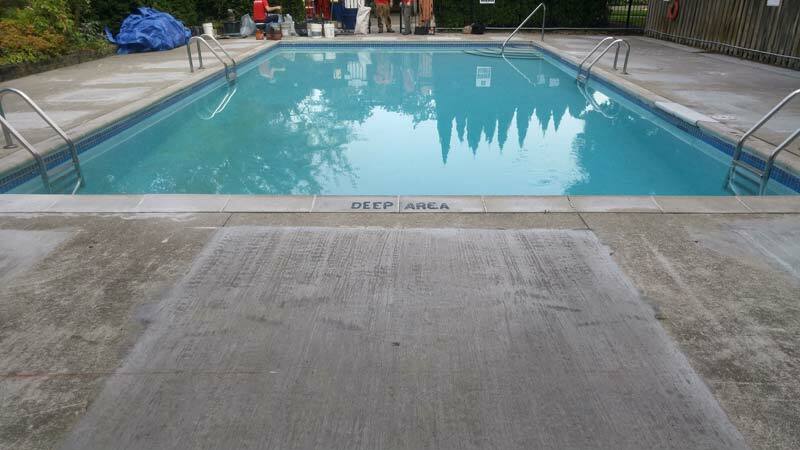 Details: Concrete pool deck was looking a little bit old and in need of fresh clean new look. 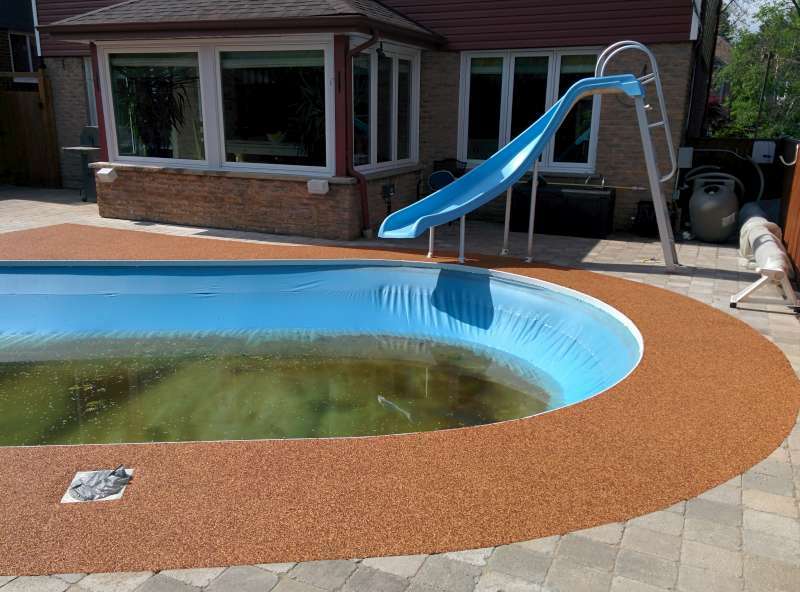 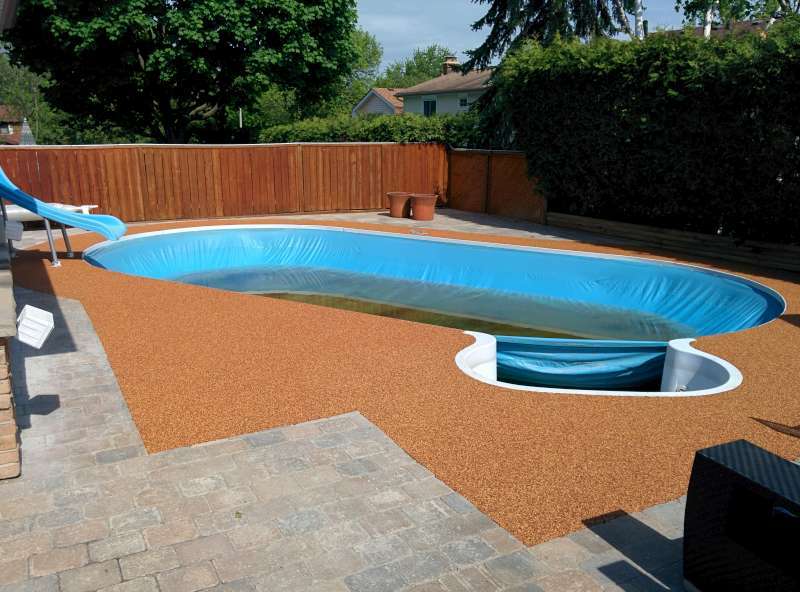 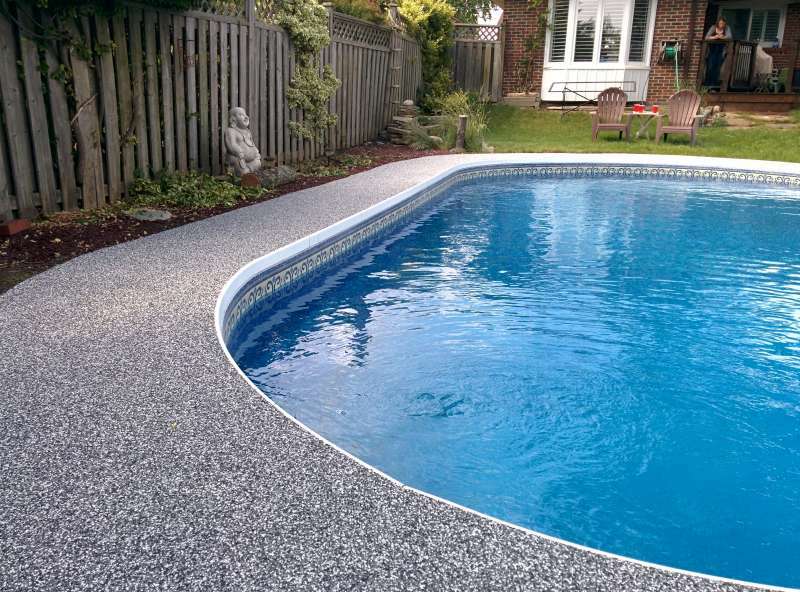 The surface was revitalized using EPDM rubber to create a safe and beautiful surface that will withstand the Canadian climate. 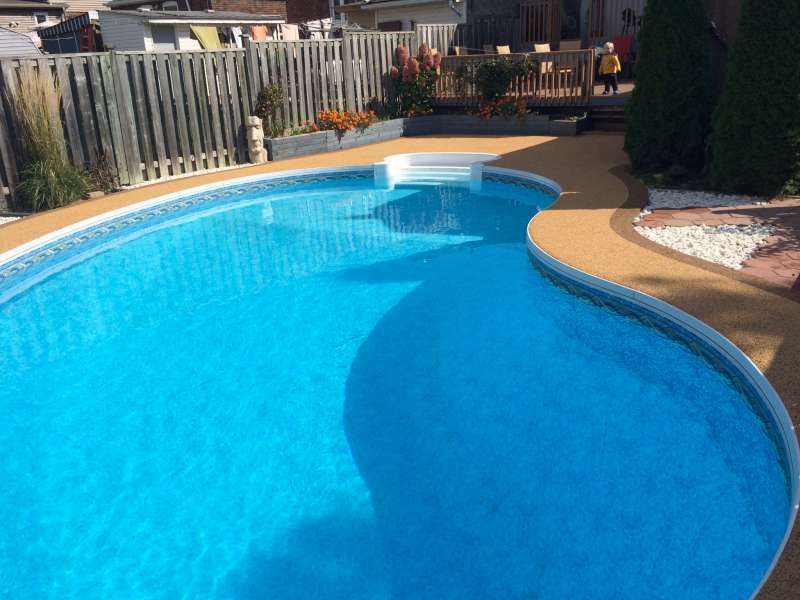 Details: Paul LaFrance and his team needed the finishing touch on a spectacular backyard transformation. 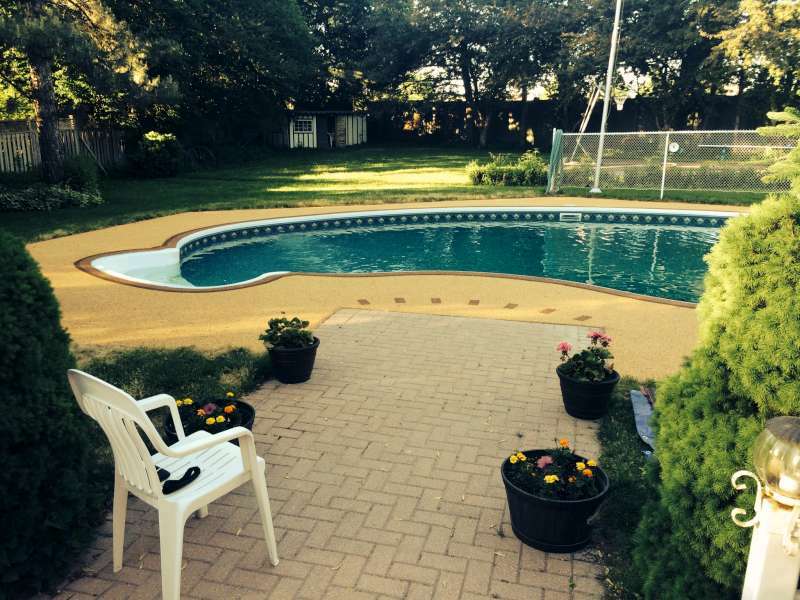 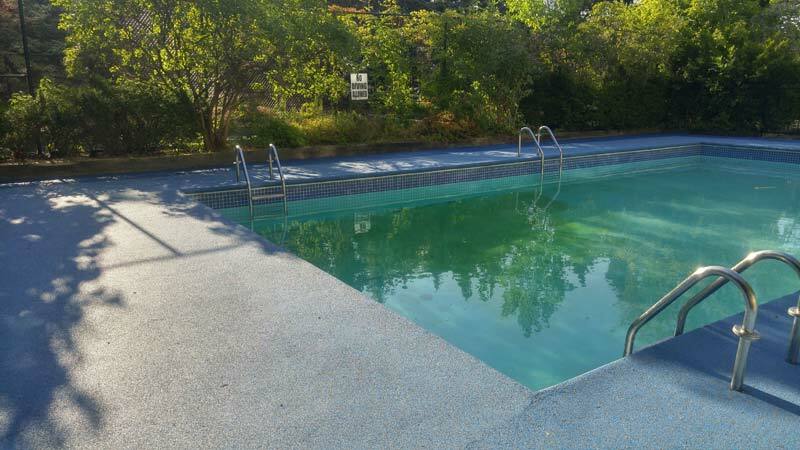 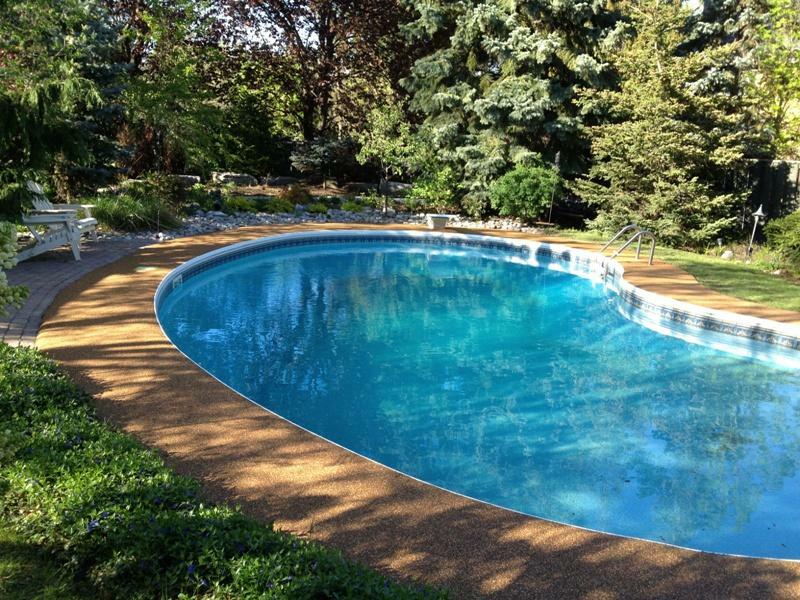 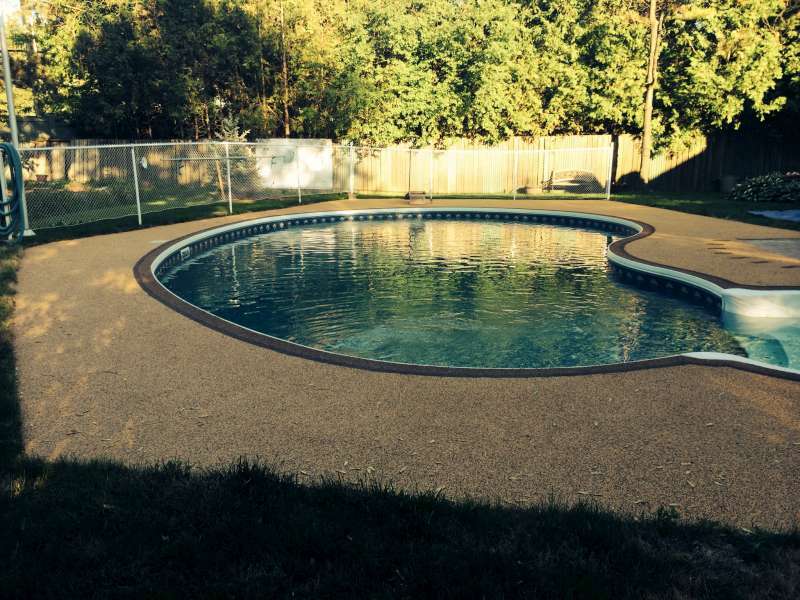 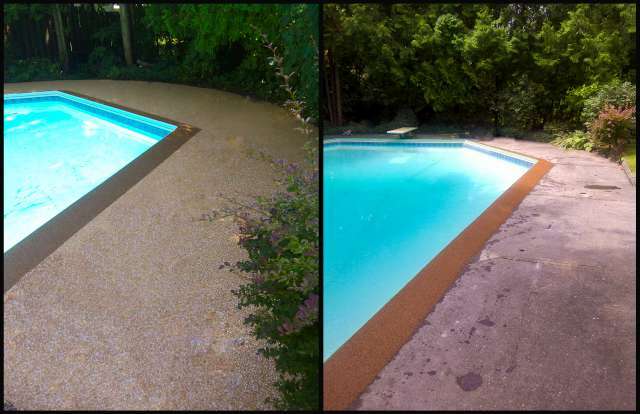 We resurfaced the old concrete with a beautiful new EPDM pool deck covering to create a safe and stunning pool deck. 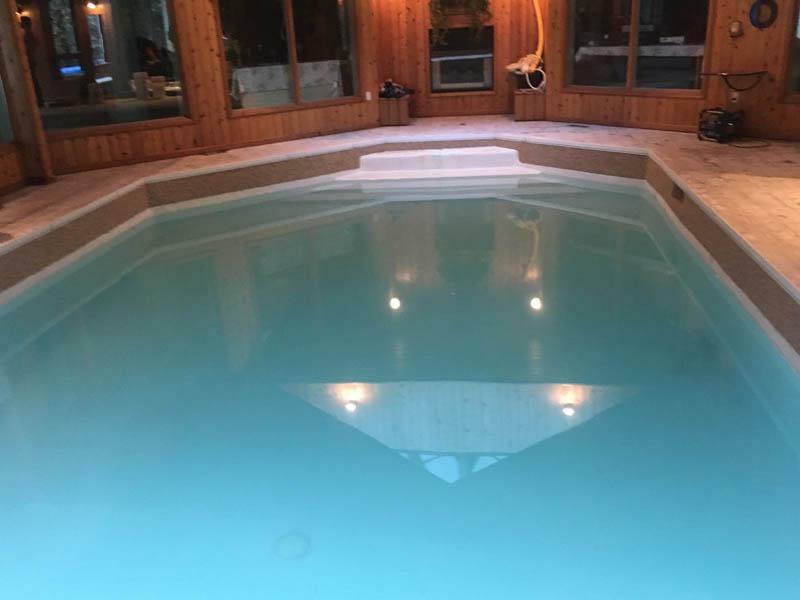 Check out the episode on our home page for a look at the transformation. 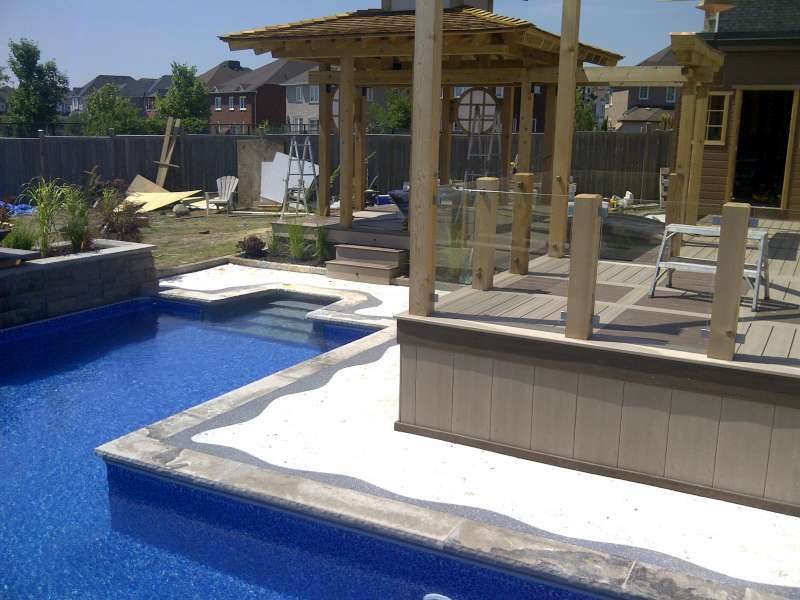 Details: One of our first episodes on “All Decked Out! 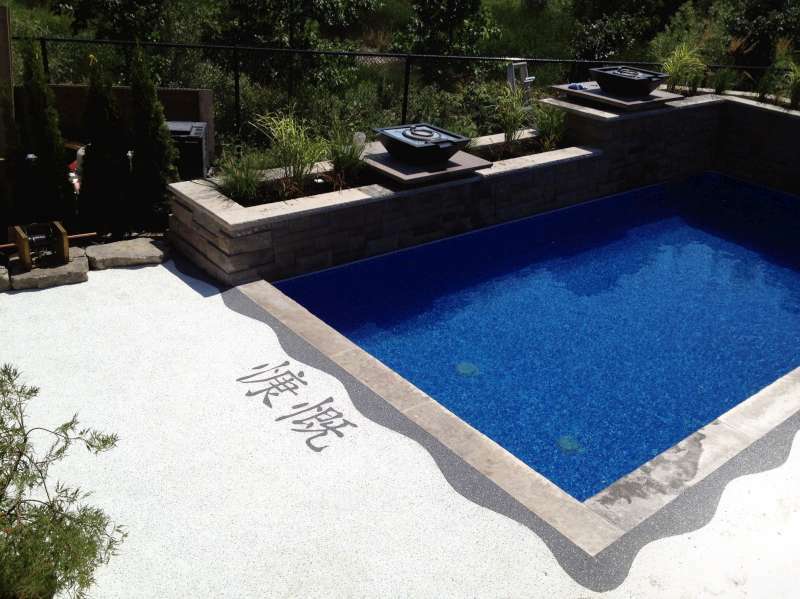 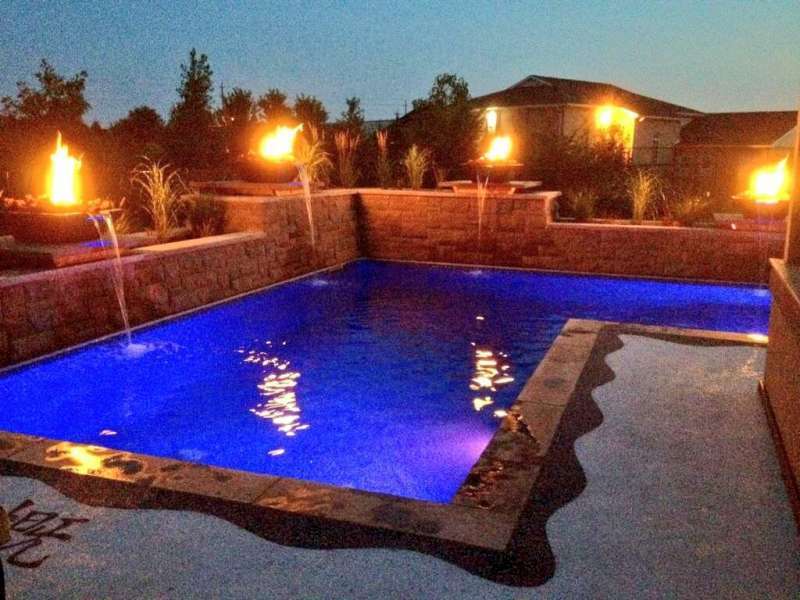 We collaborated with Paul LaFrance and the client to create a one of a kind pool oasis. 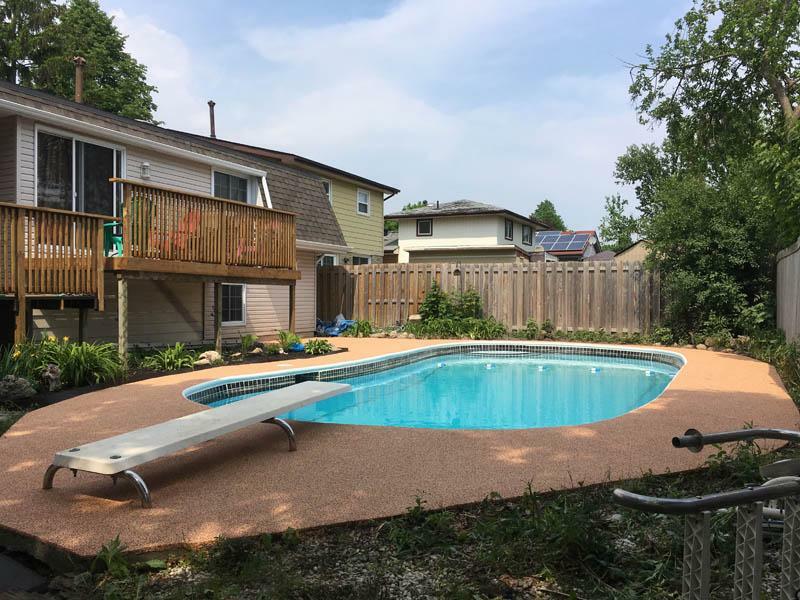 A combination of white and grey rubber was used to create a soft and safe pool deck for the kids to play on and a beautiful deck for the parents to entertain on. 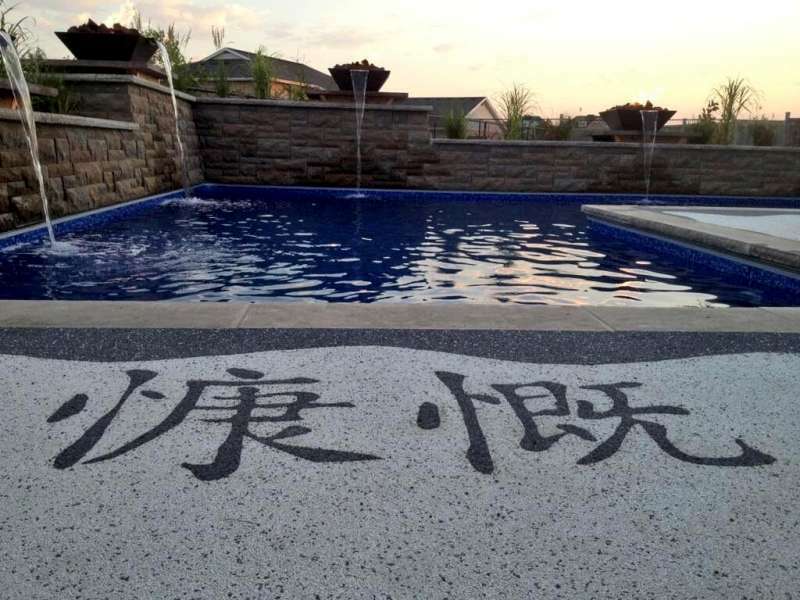 Custom boarders and Chinese characters were inlayed into the surface for that one of a kind look. 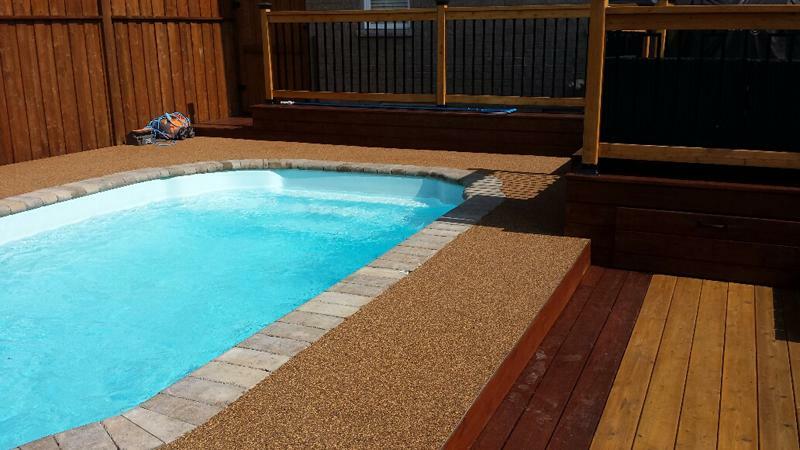 Details: A new build pool deck was created using a wooden frame and pressure treated lumber. 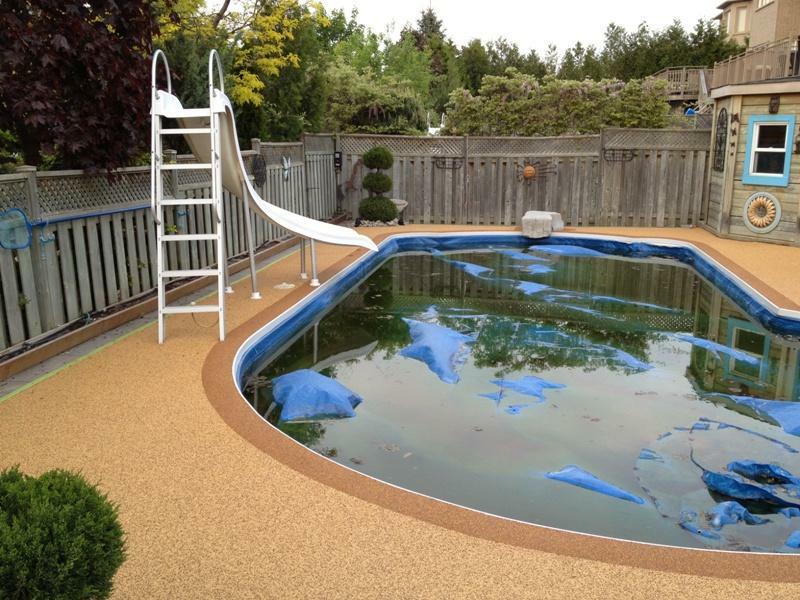 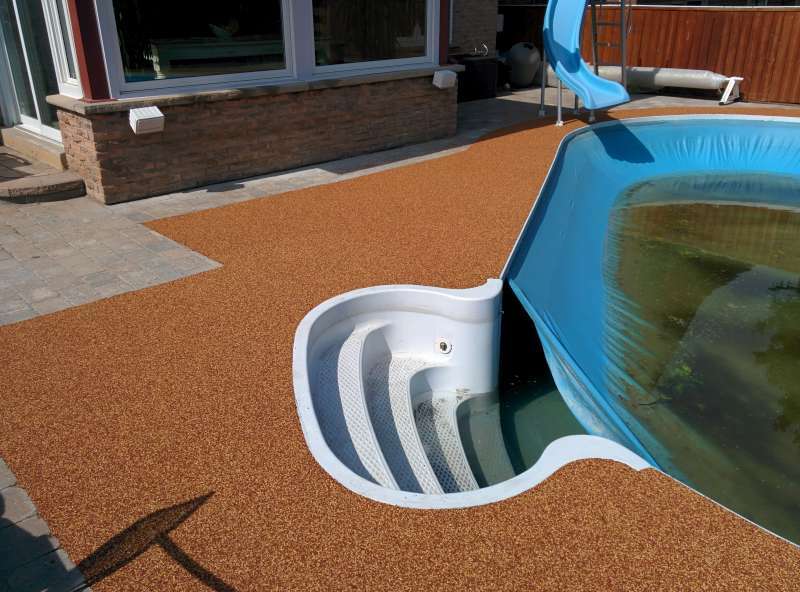 The surface was then sealed and surfaced using EPDM rubber to create a safe oasis for both kids and parents. 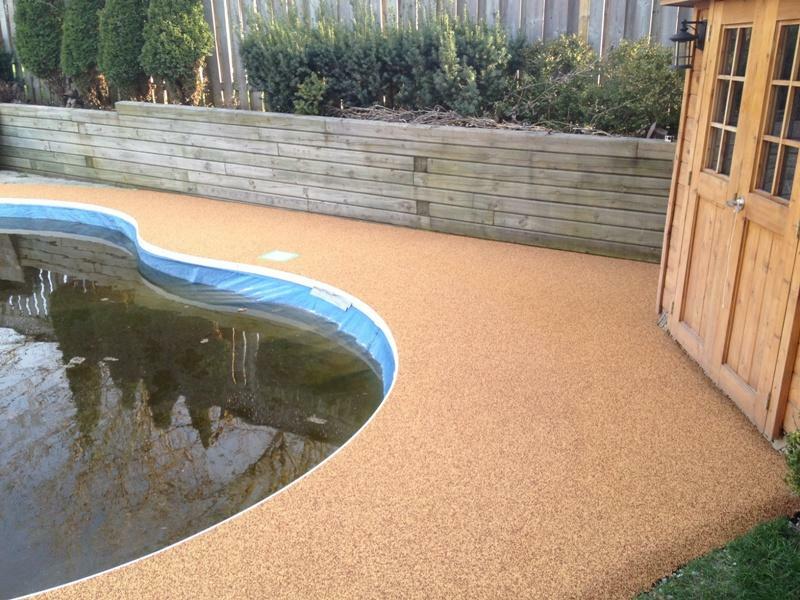 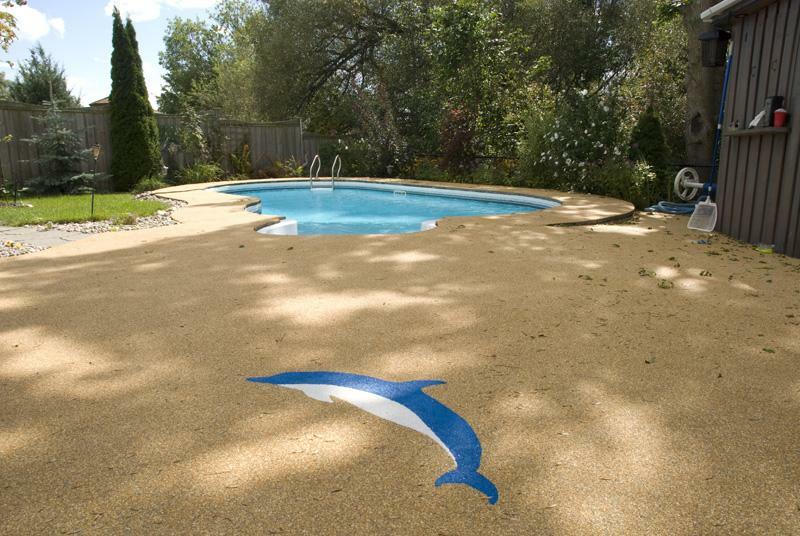 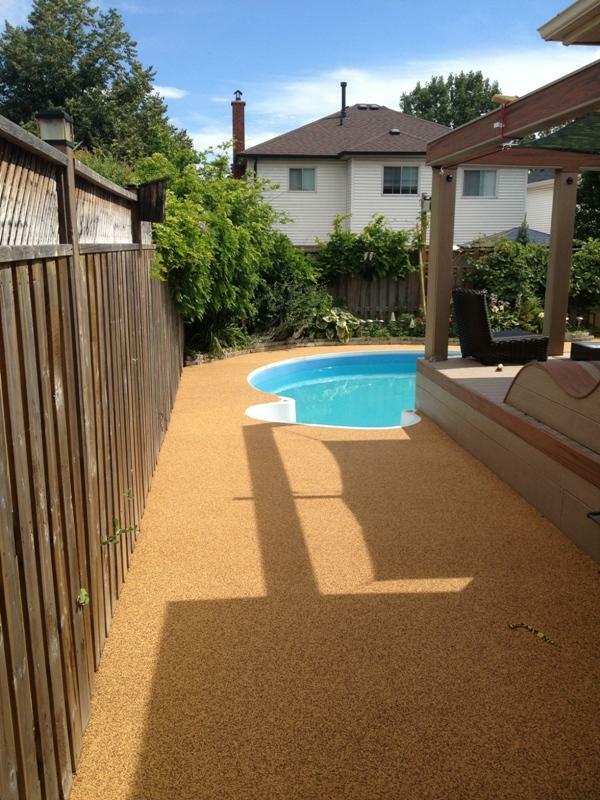 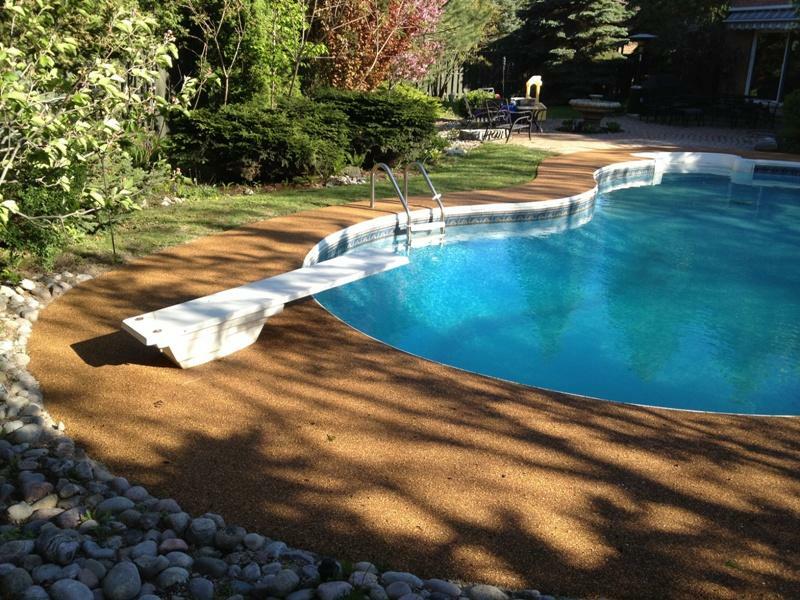 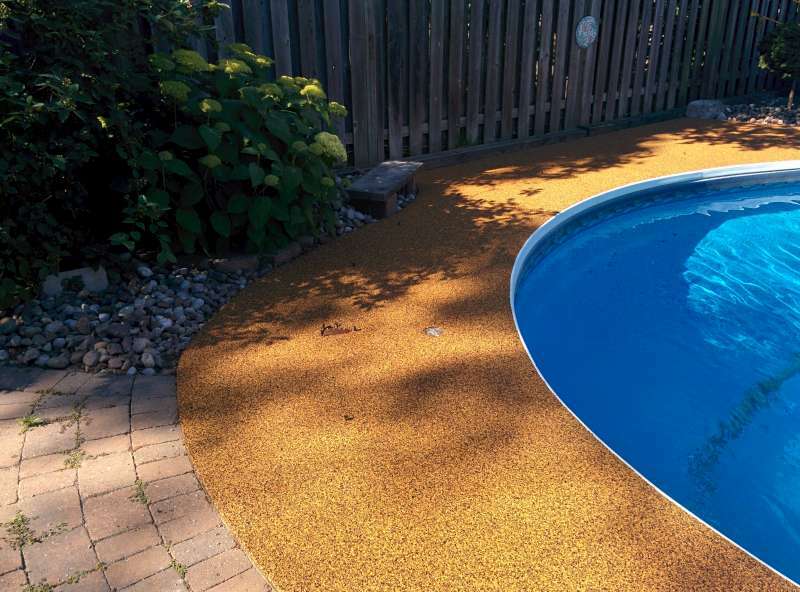 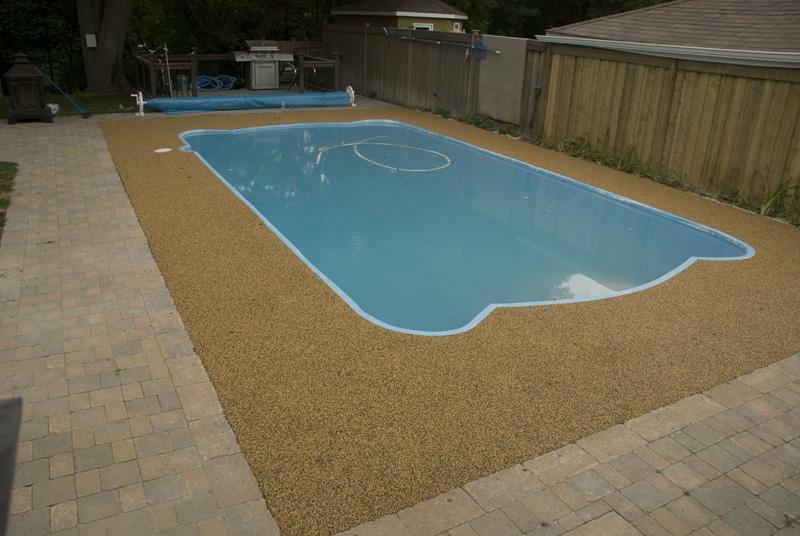 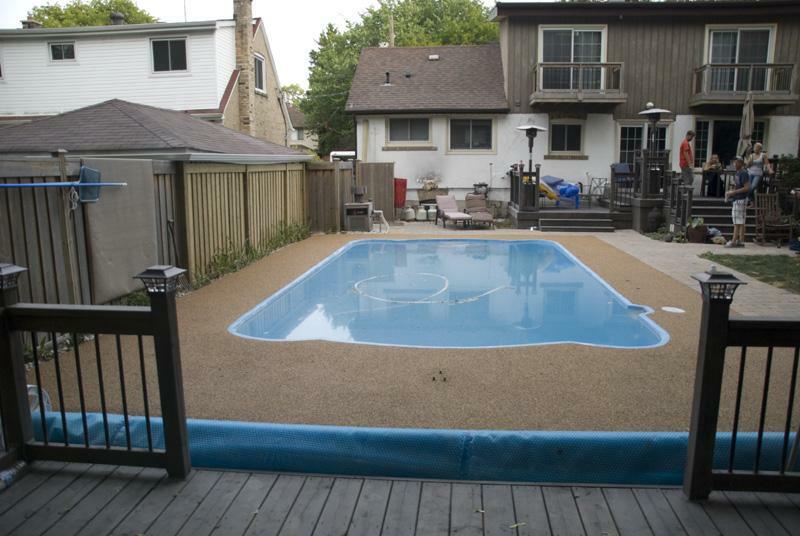 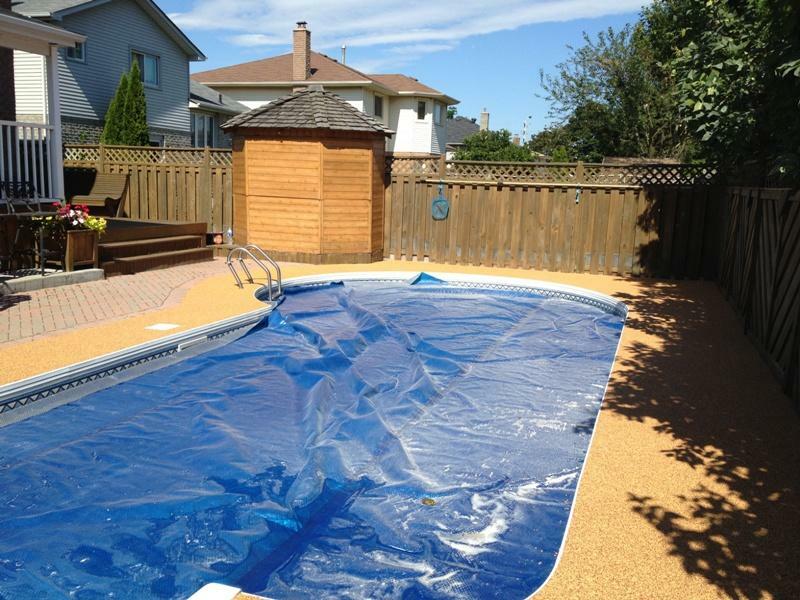 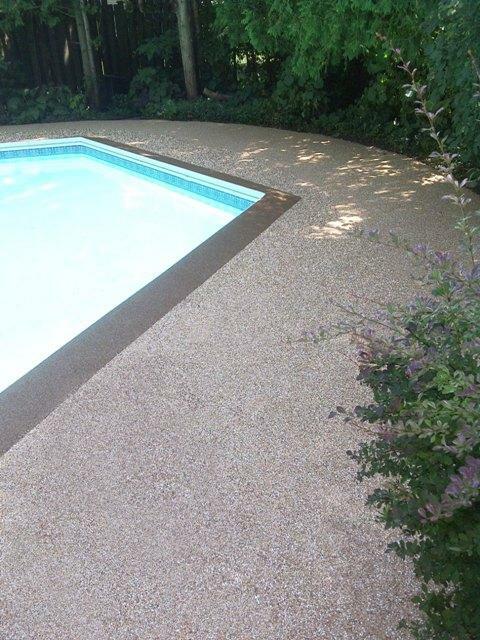 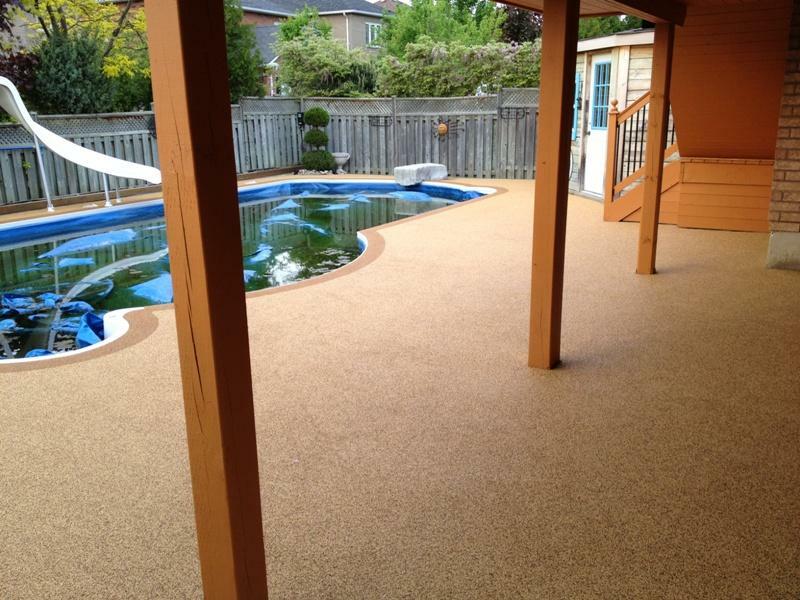 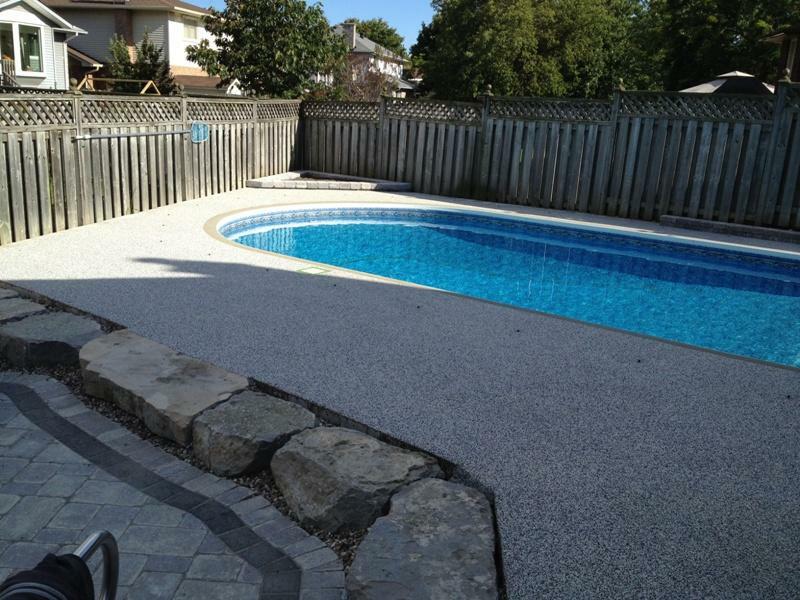 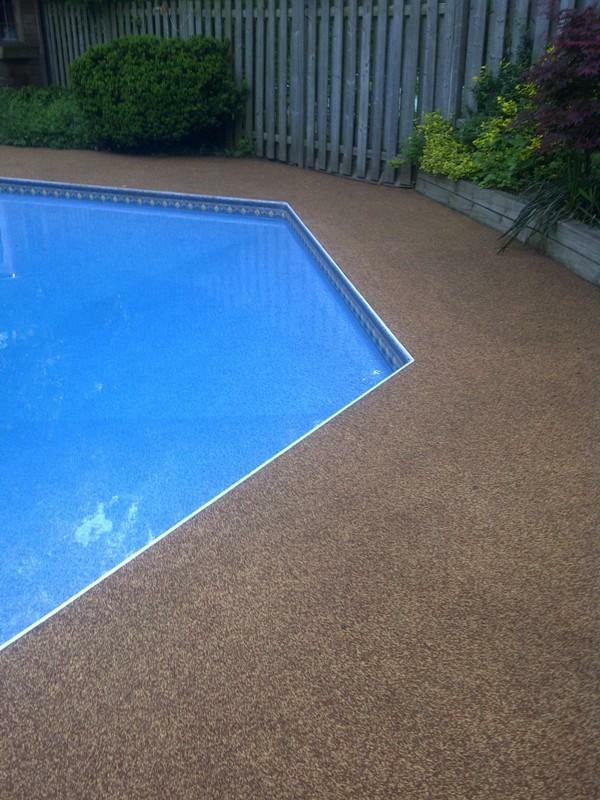 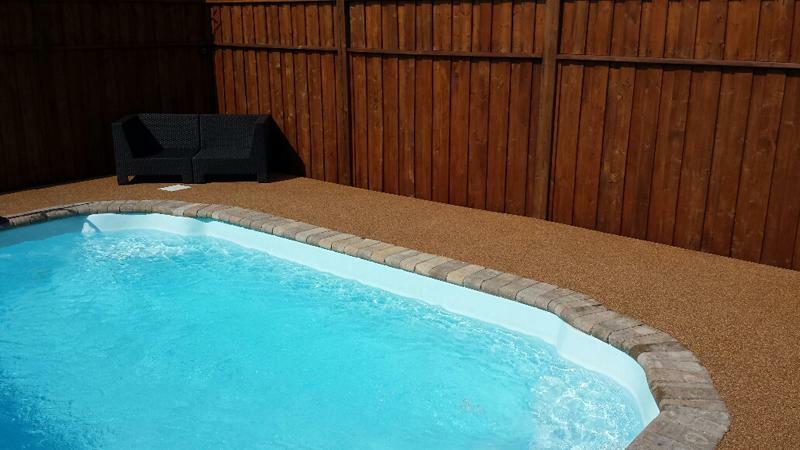 Details: Patio stones and concrete were covered with our safety surfacing to re vitalize this old backyard pool deck. 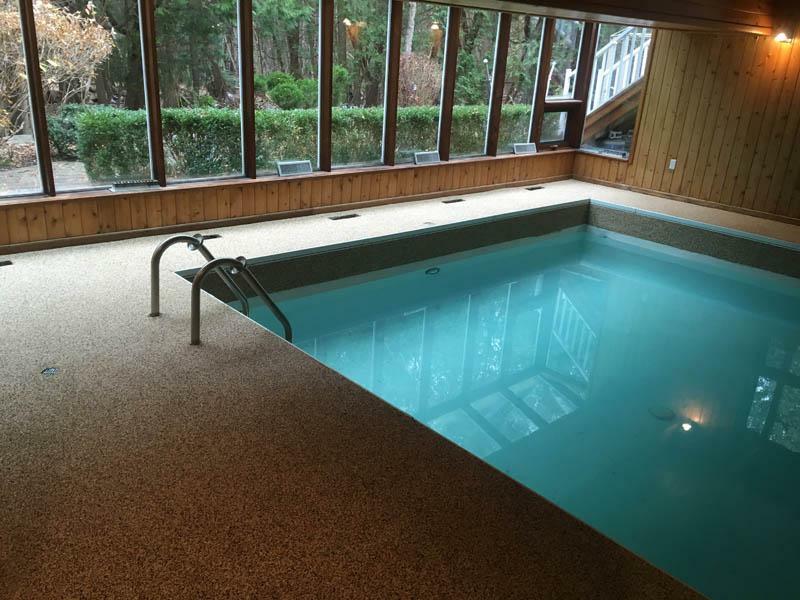 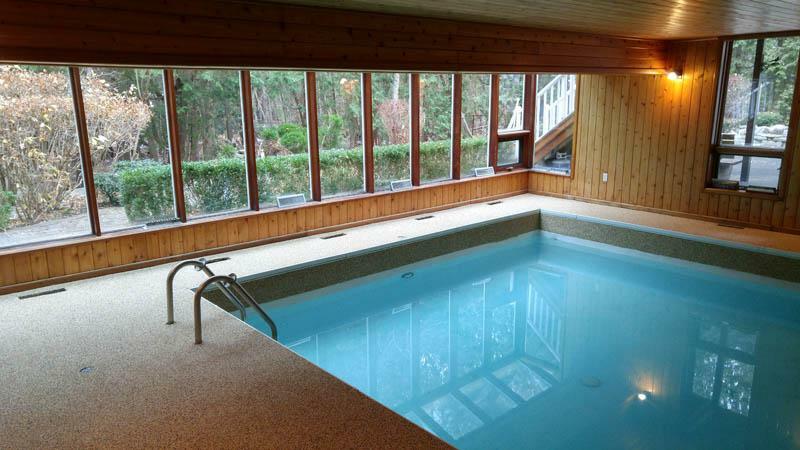 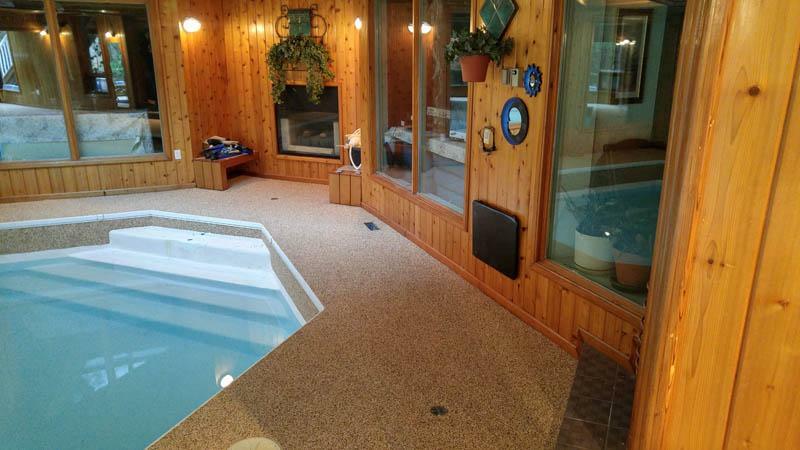 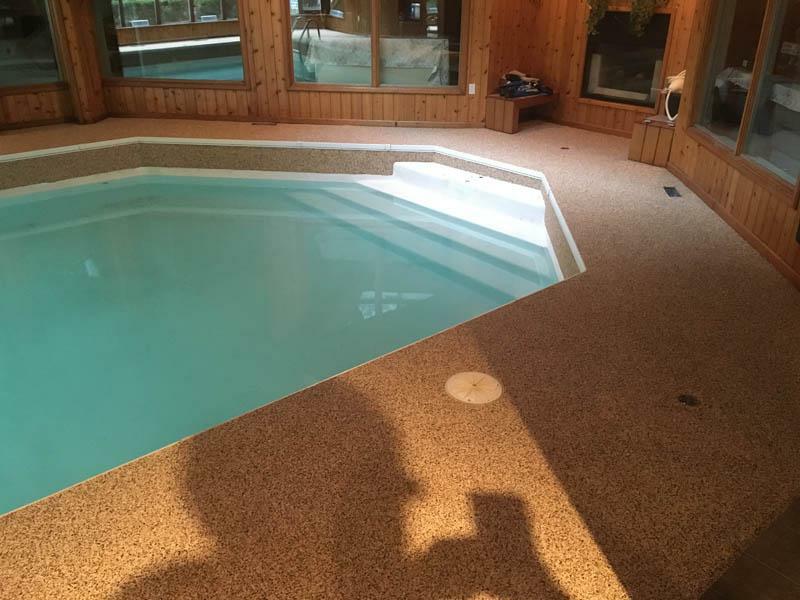 Details: This indoor pool deck had chipped and slippery ceramic tiles. 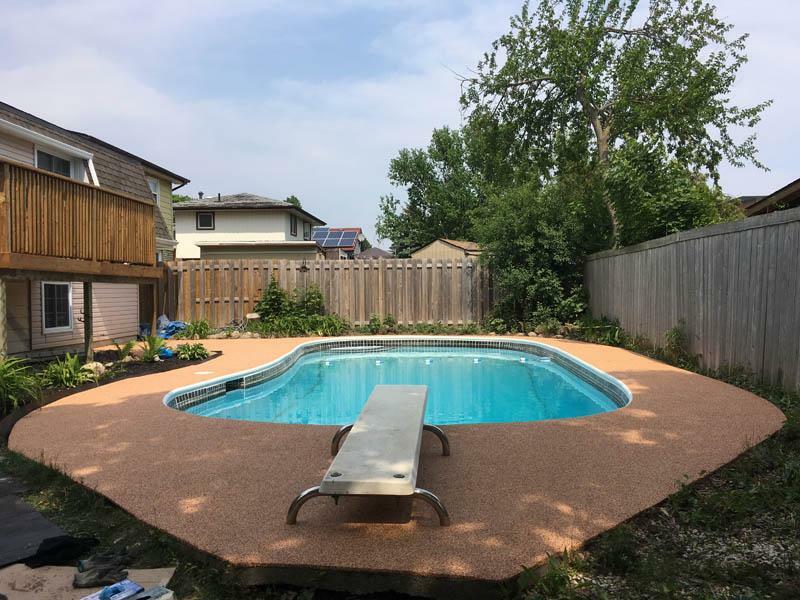 We removed all the old tiles, fixed any damage in the concrete base and sealed the surface to protect the concrete against moisture. 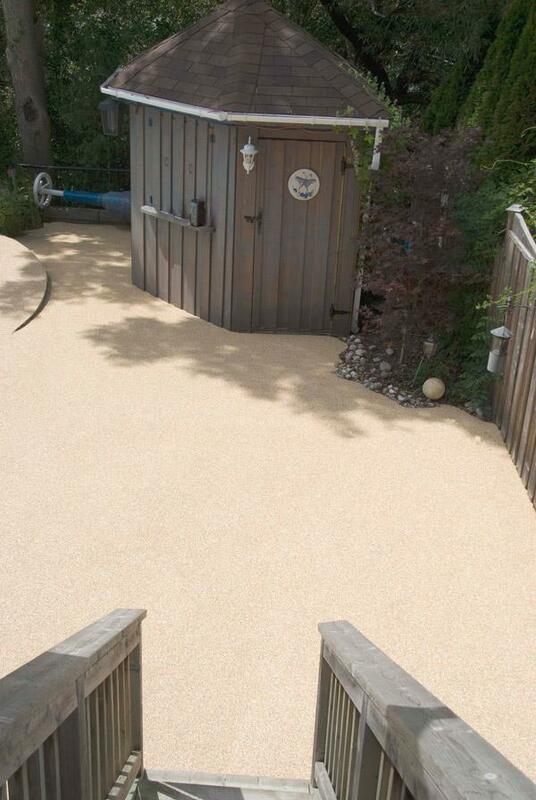 We then covered the prepared concrete with our Rubber F/X non slip surfacing for a safe and beautiful indoor area. 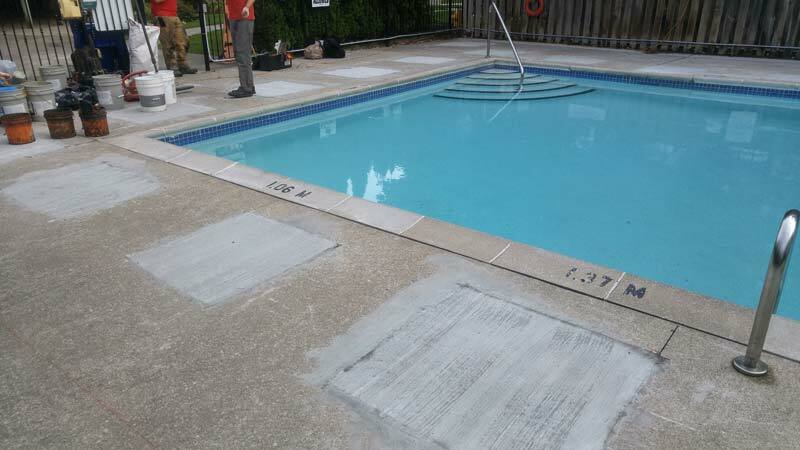 Details: This concrete pool deck had some cracks around the diving board and near the entrance to the stairs. 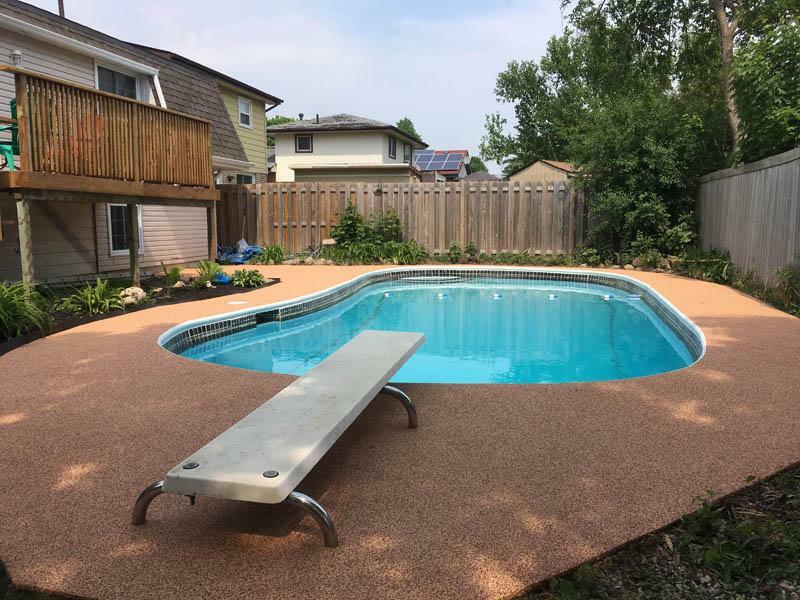 We sealed the cracks withe moisture cured polyurethane resin and re leveled the concrete before apply Rubber F/X Safety surfacing over the sealed concrete to create a new and updated appearance for this family and kids to use. 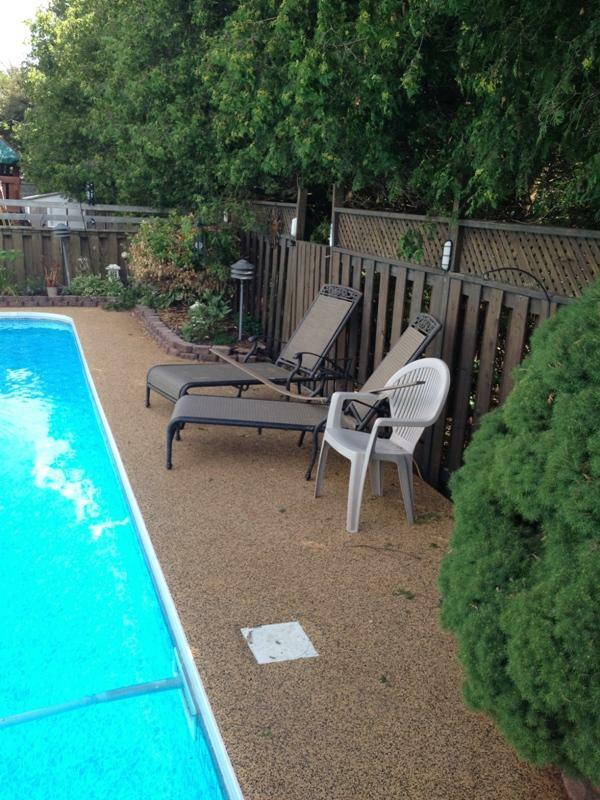 Details: This pool deck was made of flagstone, and had some issues with weeds growing in between the stones. 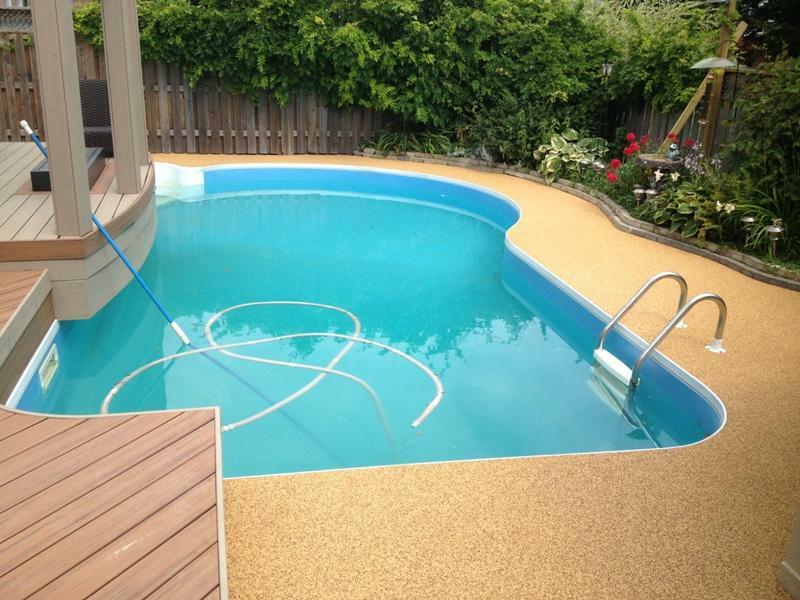 As well the family wanted to update the surface and make sure it was safe for the grandchildren to use. 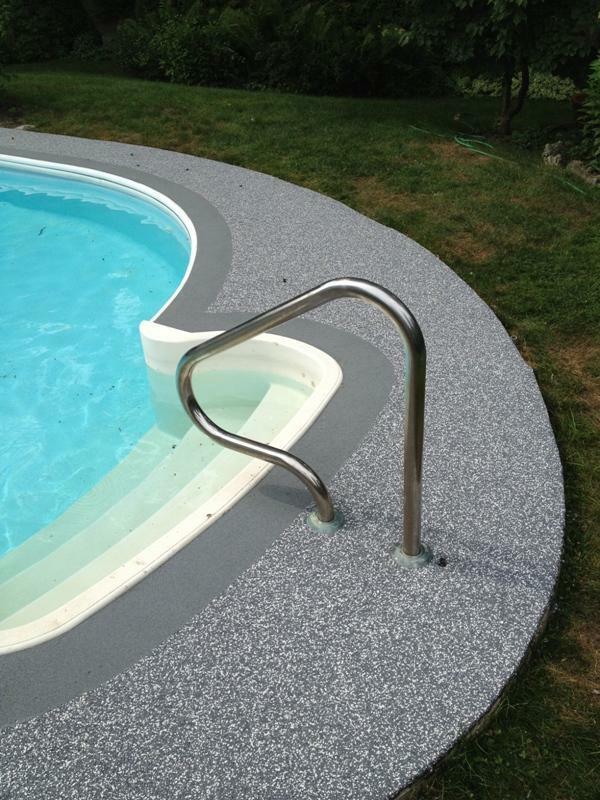 We used a custom blend of Grey and White with a flake of Brown added in for depth.